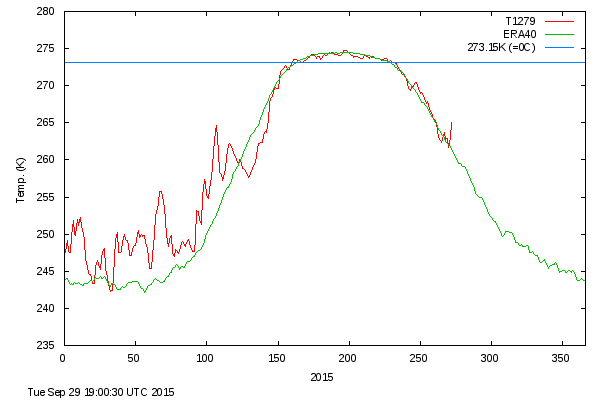 The past week has seen an interesting change up at the Pole. The high pressure that has been stubbornly parked up there on the Canadian side has drifted over to the coast of Central Siberia, and elongated. This has created a two way street of Cross-Polar-flows, one bringing Pacific air along the East Siberian coast, and another bringing cold Siberian air the other way across to Canada and also a spear of milder Atlantic air right over the Pole as far as the Canadian coast. I’ve been watching these invasions carefully this winter, and noting how they seem to precede weather events down south, where I live in New Hampshire, by roughly a week. The invasions seem to “nudge” the build-up of cold air off the Pole and down south through Canada, to the USA, where they make headlines. Two nudges ago brought us the Washington DC blizzard, and then that snow swiftly melted away as the nudging ceased and the cold built at the Pole. Then a smaller nudge sent another outbreak south, but it was strong for such a little nudge, and set records for cold even though it was brief. Now it is warm again, reflecting the last period the cold was building up at the Pole, and I’m expecting another outbreak a week from now, due to the current nudge. 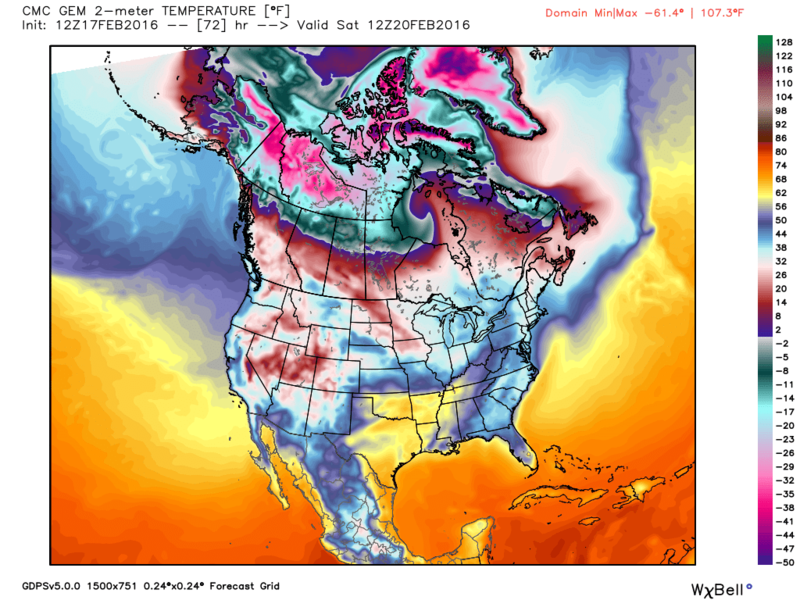 Looking at a Dr. Ryan Maue map (from the Weatherbell Site) of temperatures three days from now (Canadian JEM model) you can see the bright pink in northern Canada, indicative of temperatures down at minus 40, (that great temperature where Fahrenheit and Celsius finally agree). The surface map for that time (three days from now) shows an interesting low over northern Hudson Bay, and the north winds on its west side seem likely to shift that very cold air south towards me. I don’t imagine it will warm much as it comes south, for it will be passing over snow-covered landscapes, and the nights are still longer than the days. A look down from the top of the planet five days from now sees that low still parked over Hudson Bay, and a new low north of Greenland. In fact the high pressure over Greenland seems totally surrounded by storms. What is especially interesting is that the temperature map five days from now shows that, despite the invasion of milder air over the Pole, major cold remains over both north Canada and Siberia. The imported mildness is being squandered, lost to outer space, without warming the tundra much, though perhaps it is nudging that tundra’s cold south to places where it is unwanted by the old, and enjoyed by the young. The invasion is causing the temperatures-north-of-eighty-degrees-latitude graph to show warming. I would expect the invasion from the Atlantic to compress the sea-ice to the north, decreasing the extent of the ice, but so far the extent-graph shows a slow rise. With storminess increasing at the Pole, it will be interesting to watch the NRL map of how the ice is moving. 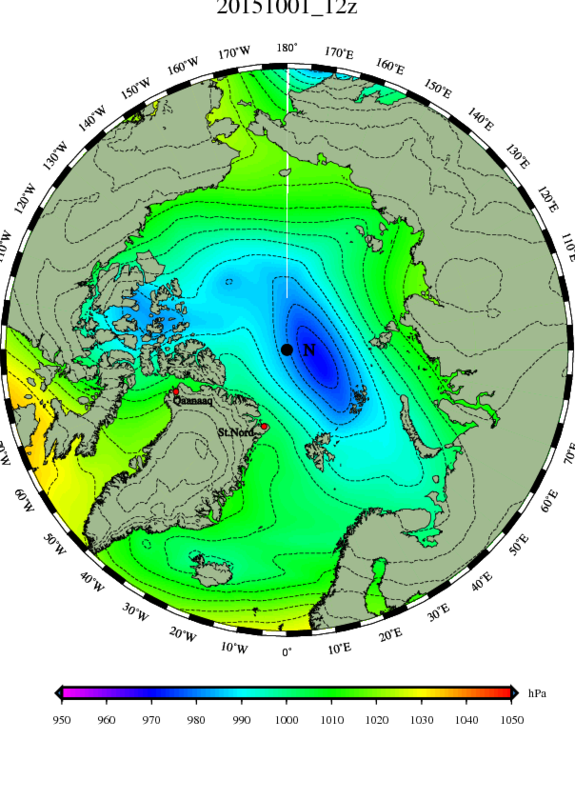 Currently it is describing the shape of the elongated high pressure, and the ice is staying put in the Arctic Ocean, with little being flushed out. The above map shows fast-moving ice crashing into slower ice north of the Mackenzie River Delta, likely building pressure ridges, while some leads are opening up north of Bering Strait, where faster-moving ice accelerates away from slower ice. A lot of shifting and crunching is likely to occur over the next week, and I am going to try to post more of these maps that show how the ice moves. They clearly show how mobile the ice is, and refute the idea that sea-ice is static stuff that is only effected by Global Warming. O-BUOY 8b BITES THE DUST? I never like to see one of the Arctic buoys go through a blank period, when reporting data: It is especially troubling in the case of O-buoy 8b, because it is located right where the ice seems stressed, in the above ice-motion map. Also it located right on the edge of a sort of San Andres Fault, formed within hours of when the bouy was placed last fall. 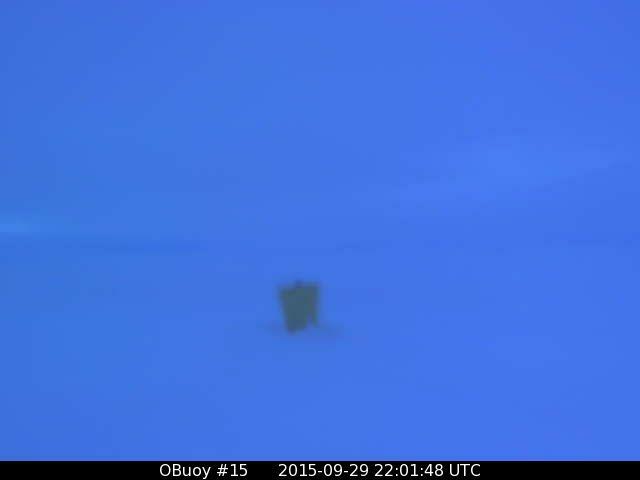 If you have two minutes to spare, it is well worth watching the time lapse movie made of pictures taken by the O-buoy 8b camera last fall. Among other things, it shows within an hour of the men working to place the camera on the ice, the ice cracked up. 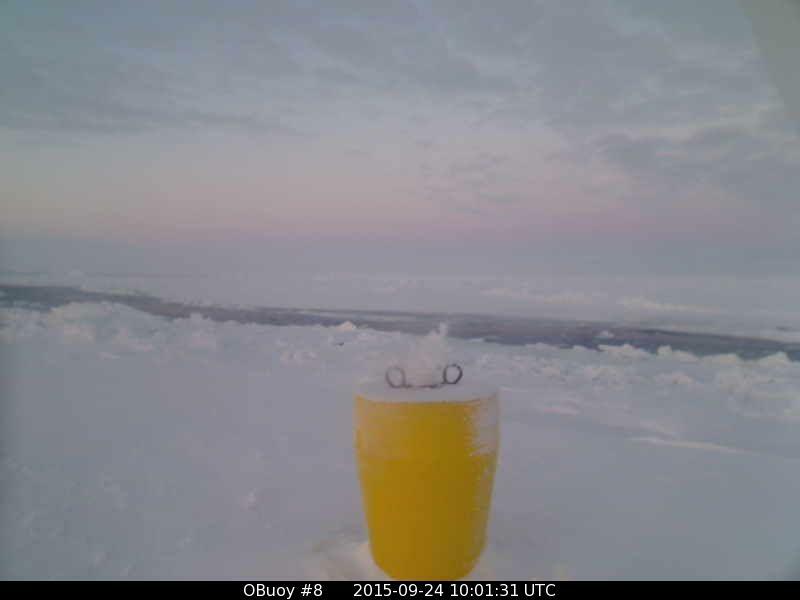 This does make one think about the risk the men take, installing those cameras when the ice is weak in September. (Not to mention the chance of meeting a 1500 pound bear.) It also makes me wonder if the icebreakers they ride up there on actually weaken the ice, and cause a sort of structural failure of areas greater than the channel made by the boat itself. 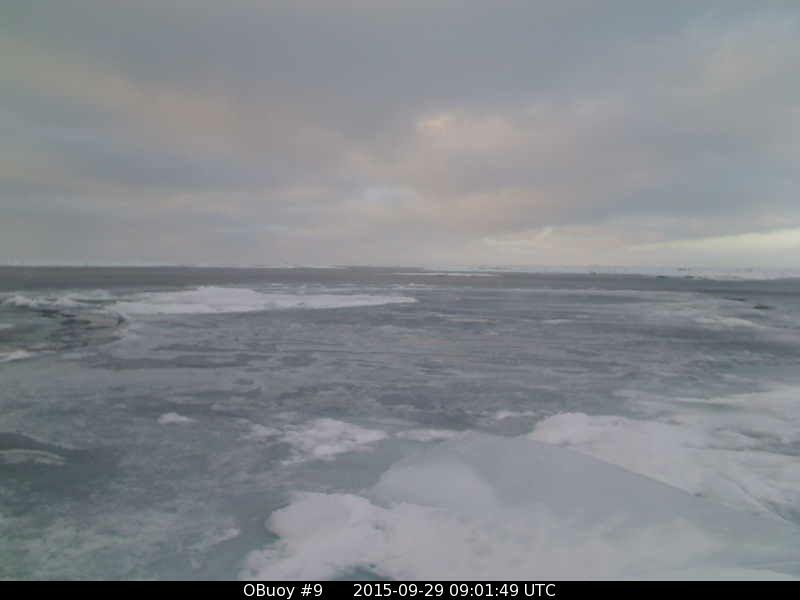 (I know it works that way when they break up the ice in harbors in the spring.) 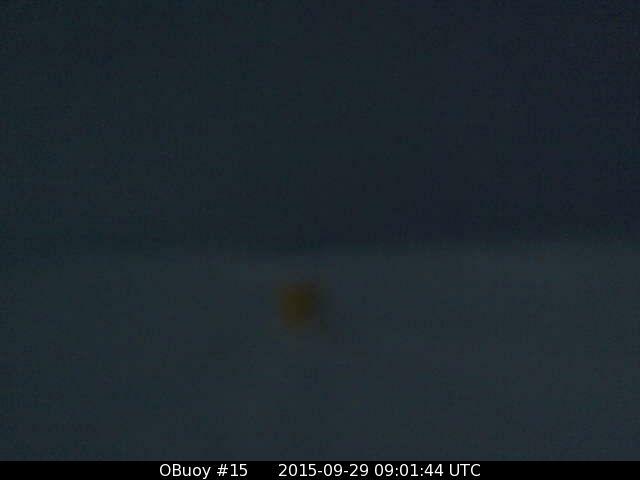 Here is a picture of the Mass Balance Buoiy 2015 right after it was placed last August. (Note the vanity of the graffiti. Seems odd that fame is seen in having your name appear where it is likely only a polar bear will ever see it.) 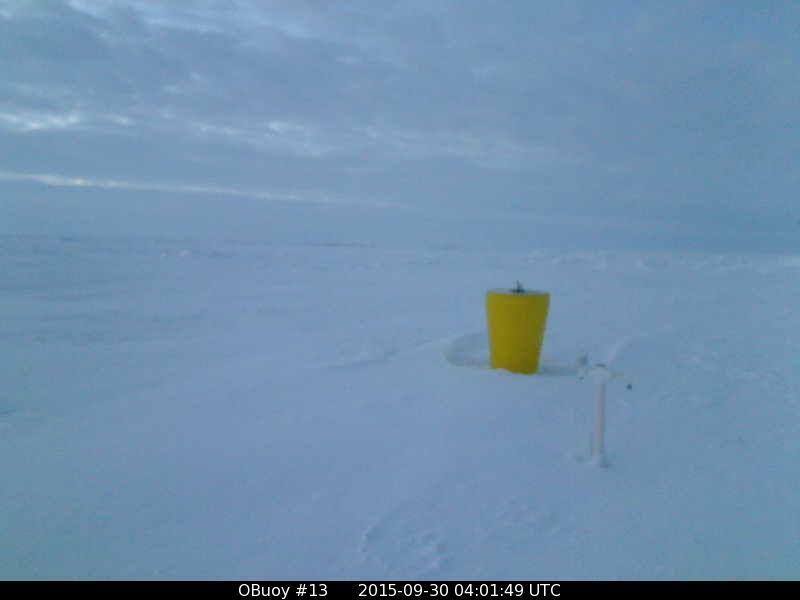 And here is a picture of Obuoy 13 after it was placed. Note the solar panels, which may explain why there are no pictures after the sun sets for the winter. The GPS must have a separate battery. 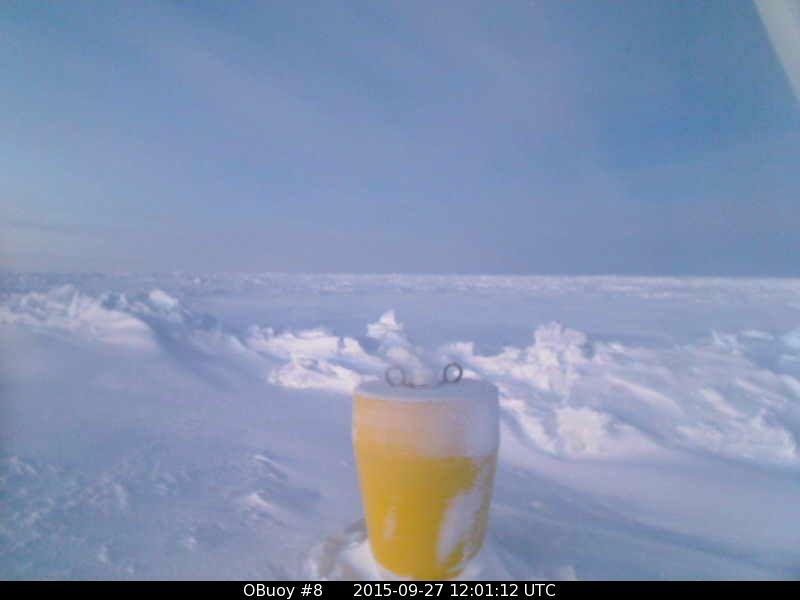 Sometimes these buoys come to life after surprisingly long periods of time off the air. One came back last summer after more than a month. Perhaps they get tilted, and can’t properly transmit. Also I read there can be times they can’t get room because other projects are using the available space on the Satellite they must all share, when transmitting. 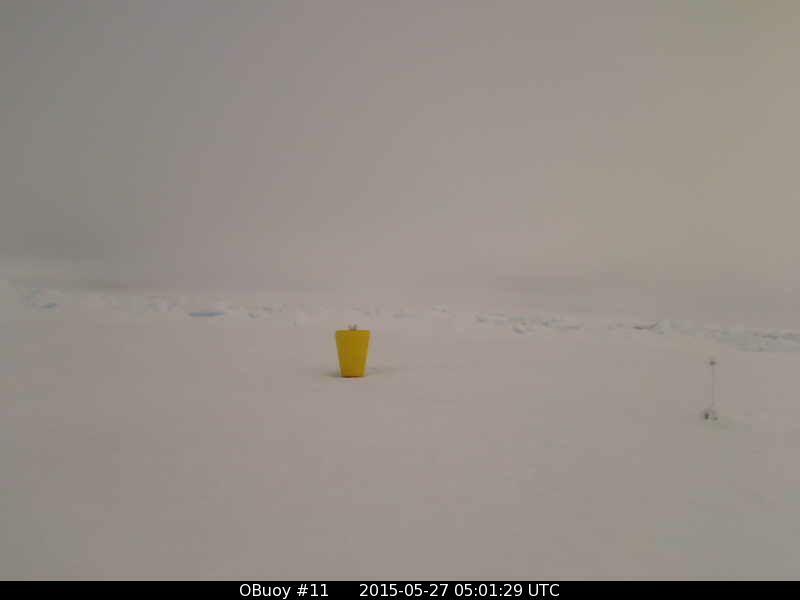 In such cases the buoy has the ability to save data and send it later. I hope we see O-buoy 8b come back soon. Despite the steady import of milder Atlantic air up over the Pole, the cold continues to build in northern Canada. 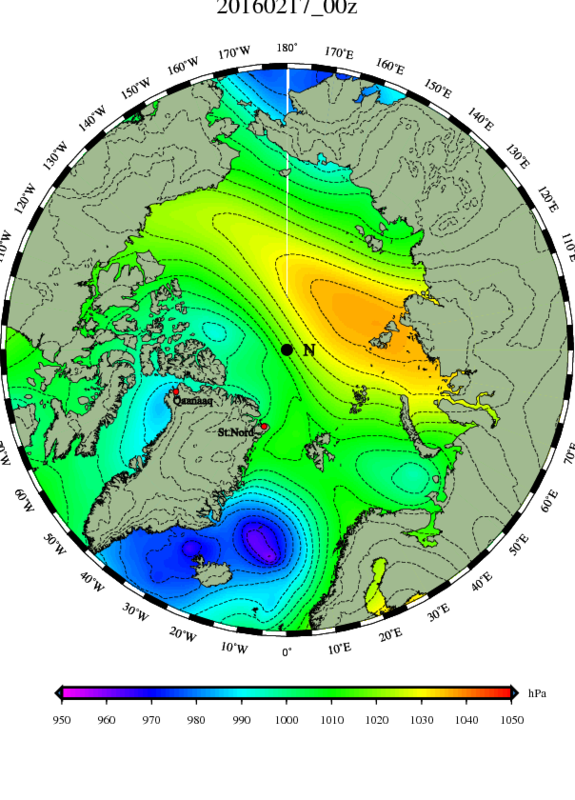 Also a lot of the “nudged” air spilled down the east coast of Greenland and is chilling the north Atlantic, cooling the western shores of Europe. 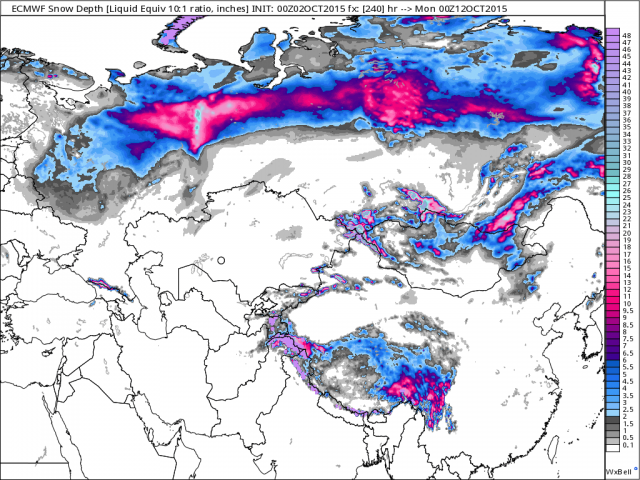 Joseph D’Aleo has an interesting post on his blog at the Weatherbell site about the possibility of late-season snows in Europe. I can’t claim I saw that cold air sneaking around from the northwest, as usually the Atlantic moderates the arctic air, but it sure looks like the western coasts of Europe are cooling. Their midwinter surge of mildness seems to be flipping. In fact I think this winter will wind up being remembered for a lot of flip flops in both Europe and North America. Europe has been spared the steady blasting of Siberian cold China has gotten, (and that I remember too well happening here last winter). (Personally I mind winter a lot less when it is served out in small helpings.) 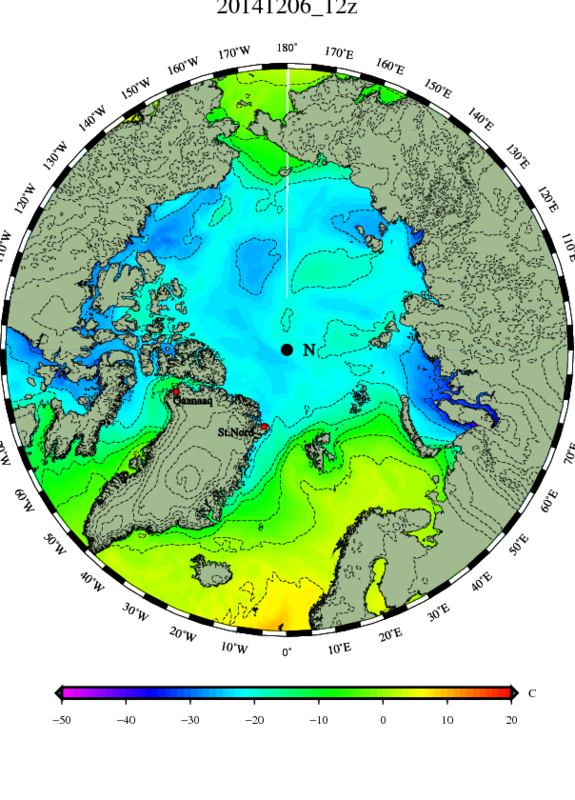 The DMI maps show the cross-polar-flow swinging from Siberia-to-Canada to Scandinavia-to-Alaska, but the milder air continues to flow over the Pole. It cools fairly dramatically as it approaches Canada, partly because there is still no sun close to the Pole, and partly because the air rises and doesn’t show on surface maps. Because the air is rising we are expecting low pressure to appear north of Greenland. 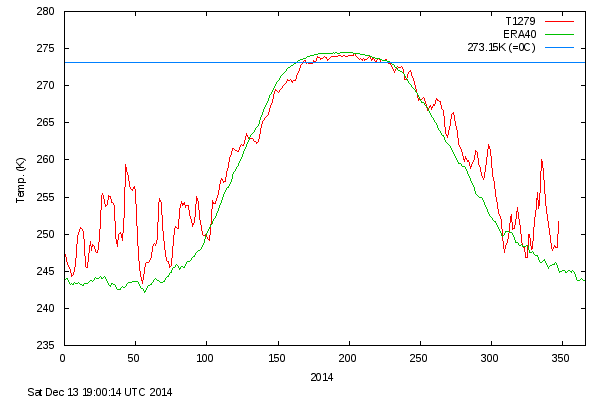 The winds pushing the ice back towards the Pole is finally showing a reduction of ice-extent on the extent graph. I confess I’m nervous about the extent being low. 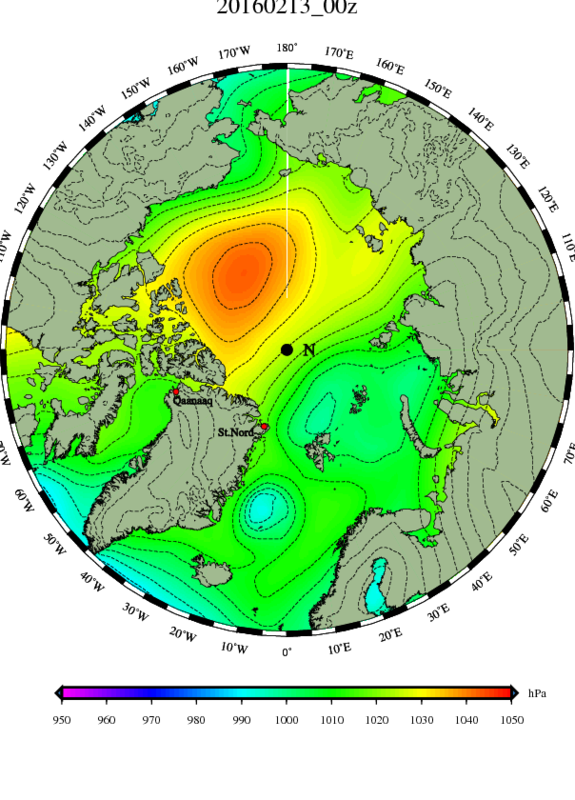 If it is a “record” low the hubbub of the Alarmists will be hard to bear. They will fail to mention that the mildness up towards the Pole meant the arctic air was displaced, and places like Mexico and Saudi Arabia and Thailand saw “unprecedented” cold this winter (which I documented). Though I mention the mild places, on this site, they are sort of color blind, or “cold blind”, and on their sites they won’t mention the suffering of the refugees in Syria and south Turkey. Instead they’ll start the tiresome “Death Spiral” malarkey all over again, and will wait in breathless anticipation of an ice-free Pole this summer, and suffer depression when it doesn’t happen. The only gleam of hope I have is that the “displacement”, (more properly called “nudging”), looks like it will continue, and we could see some late season snows. There is nothing like snows in April to hush most Alarmists, (though the worst will claim most anything proves their point). Not that I much want to see late season snows in my own backyard. I’m NIMBY when it comes to winter weather, these days. However the flip-flopping between mild and arctic does seem to bring together the ingredients that bake the cake of big storms. Last winter, once we got stuck in a frigid pattern, it stayed pretty dry. We were four inches of snow away from setting an all-time record for snow all over New England, in Early February, and then the final four inches didn’t seem to want to come. Maybe people were so sick of shoveling snow that they resorted to prayer. That is unscientific, and is among the powers (such as water vapor) that some models fail to include. In any case, we did break the record, just barely, in the end, but it was a close call. It was like Old Man Winter had us staggering, but never hit us with the knock-out punch. The old grouch has a kind side. Who knew? Around here the real “knock out punch” happened the year my mother’s mother was born, and is called “The Blizzard Of 1888”. It had 4 feet of snow, drifts over 2 story houses, and 80-mile-an-hour winds, around here, (though Boston got a lot of slush), and one thing the old reports mention is that it happened after a fairly mild and snow-free winter. So, if you are inclined to worry, that gives you a reason to worry if the winter is kind. Me? I’m just enjoying the present mild spell. That blizzard started out as light rain, with temperatures mild. Then the storm exploded and stalled, just southeast of New York City, and temperatures crashed. The ingredients for that storm seemed to be flip flopping patterns, which brought very mild and juicy air right against very cold arctic air. Of course, other things were involved as well, but I’m expecting those “other things” to get lined up somewhere, the next sixty days, and create a whopper storm. In yesterday’s post Joseph D’Aleo pulled out a brilliant trick he has, involving using the experience of the past to see the likelihood of current weather being warm or cold, or wet or dry. The trick (or part of it) starts with this map, which shows whether ocean temperatures are above normal or below normal: Most people immediately look at the above map and focus in on the hot spot in the center of the Equatorial Pacific. That is the El Nino there has been much fuss about, and it is actually fading very swiftly, especially towards South America. 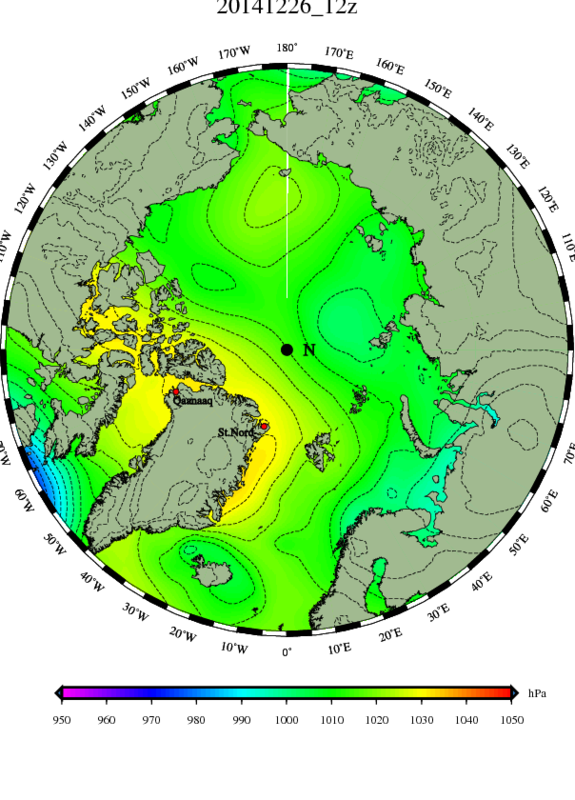 Because the El Nino is now away from South America and towards the Dateline, it now qualifies as an El Nino Modoki. 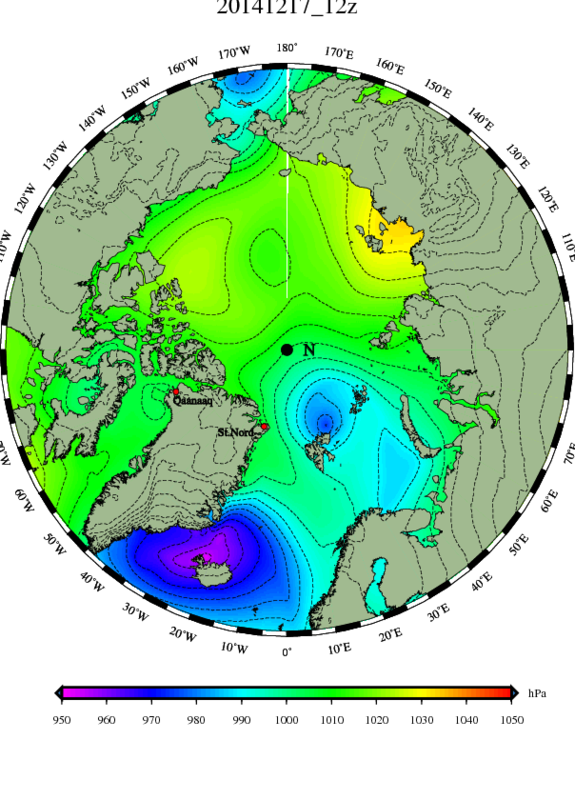 That has different effects than an El Nino sitting right on the coast of South America. The genius of Joseph D’Aleo is that he goes through all the past maps of other El Nono Modoki situations, and combines them into a sort of blended average. For my neck of the woods, such an average suggests I’ll experience a cold late-winter. But the Equatorial Pacific is not the only part of the planet. D’Aleo does the same thing for other parts of the planet. For example, in the above map you will notice there are cool pools in both the North Pacific and North Atlantic. What sort of blended averages do they give? And that’s where it gets interesting, because they totally disagree with each other. The cool pool over the North Pacific is saying temperatures should be like this over North America (which would be cold for me.) 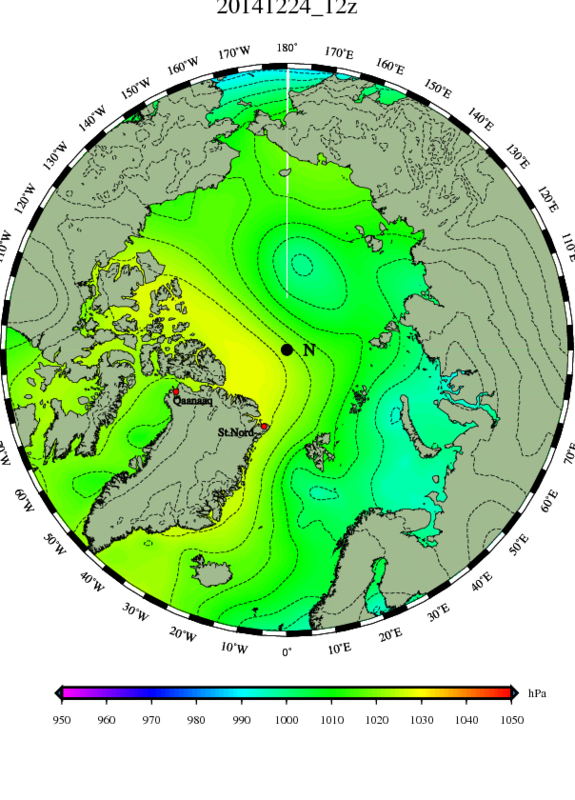 But the cool pool in the North Atlantic states this is likely (which would be warmer for me). What a contradiction! My guess is that, (because we cannot see both), we will see a flip-flopping clash, which may create the meetings of mild and cold that creates historic storms. However there is another lesson to be learned in this. It is this: You must be broad-minded. If one only looked at the Pacific, or only looked at the Atlantic, one would obviously miss the big picture. In like manner old coots like me must not only look at how high hornets build their nests, or only look at how fat the deer are, or only count the black sections of woolly bear caterpillars. This is what drives me nuts about Alarmists, who only look at the levels of CO2. How can they be so insanely narrow-minded? Due to health concerns I’ve been thinking a bit about my latter end, and what I might say, if it turns out we actually do stand before God and answer some Fatherly questions after we die. I think I’m going to be in trouble, if I have to answer questions about how I treated ridiculous, narrow-minded Alarmists. I wish I could proudly stand before the Lord and announce I’d been charitable, and had patiently explained all the things Alarmists were not permitting past the blinders which they so willingly wear. I wish I could even say I stomped around and kicked the wall and said nothing. Instead I fear that, when asked how I responded to pitiable people, I will have to confess that I barfed. In any case, I do not expect the current calm conditions to last. 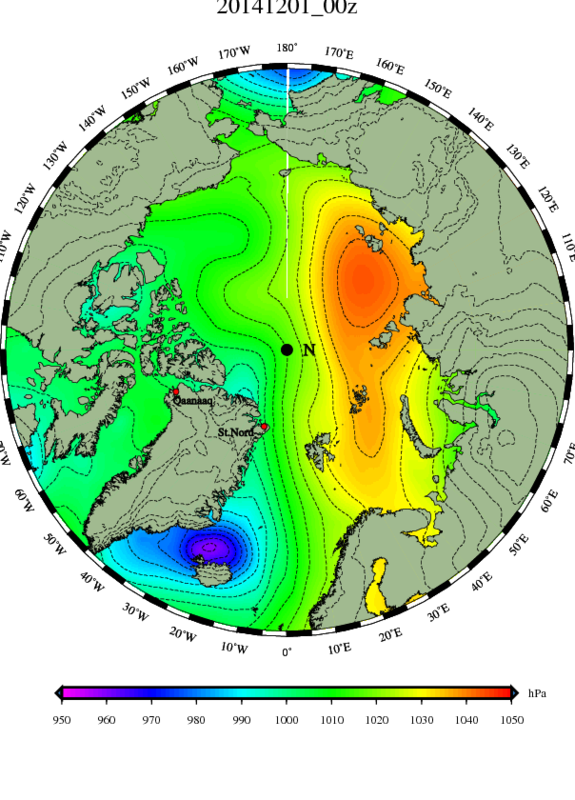 The relatively mild (but below freezing) Atlantic air moving up over the Pole has supplied the uplift, because warm air rises, to create a relatively meek low pressure up over the Pole. This will interrupt the flow of Atlantic air, and likely lead to lowering temperatures, especially if the the low fills and weakens. 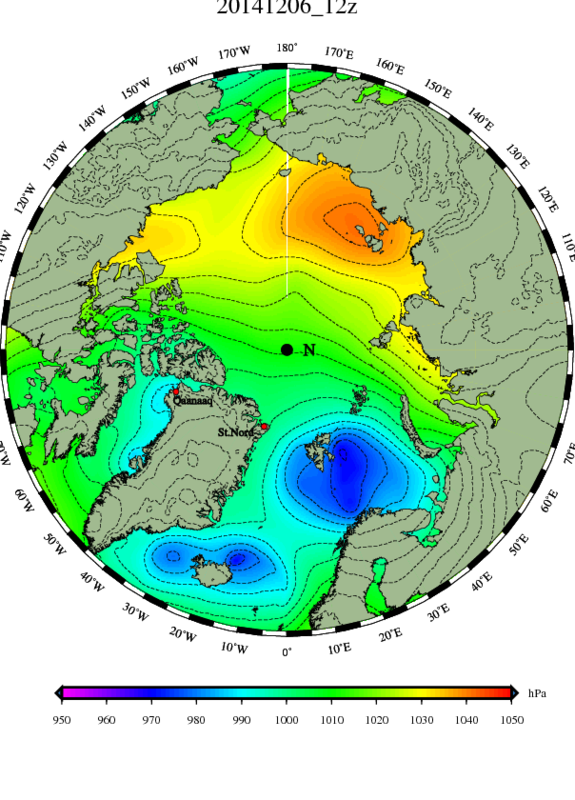 The flow over Barents Sea will continue from the south, which will continue to compress the sea-ice north, and keep the ice-extent graph low. The Laptev Sea is a great exporter of ice, due to winds roaring off shore from the depths of Siberia. Even in the dead of winter there can be polynyas of open water along the shore, as the ice is shoved out to sea, towards the Pole and eventually to crunch up against the Canadian Archipelago and Northern Greenland, which are great importers of sea-ice. 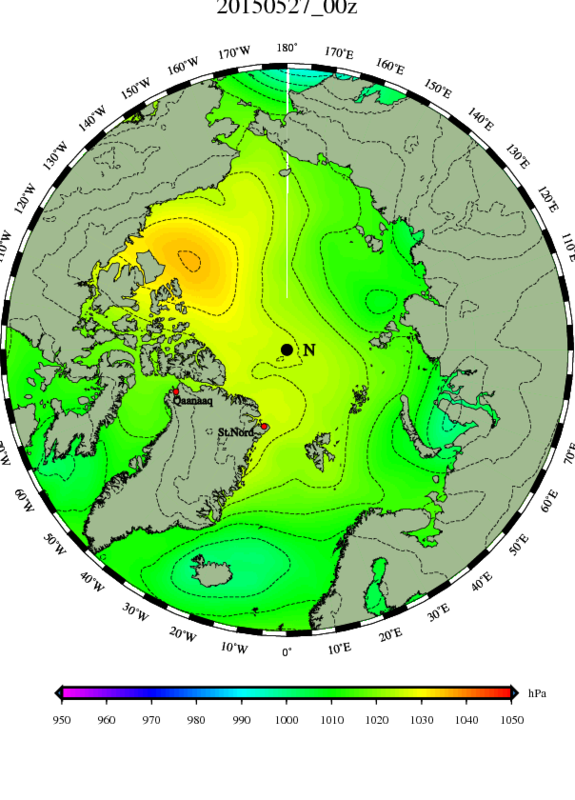 There is considerable variety in the amounts of ice exported from the Laptev Sea, and this winter has seen much less ice be exported. Perhaps this is because a lot of the Siberian cold was pushed south into China, rather than coming north. In any case, the ice is much thicker than last year in the Laptev Sea, and also parts of the East Siberian Sea. We are talking three or four or even five feet thicker, in places. This will not show up in the extent graph, which does not care is ice is six feet or six inches thick. However it is something to keep in mind, as the ice melts this summer. Ice in other places will be missing the reinforcements of Laptev ice, but the Laptev Sea itself may be slower to melt unless, of course, some late winter howling winds push all its ice off shore. One interesting bit of trivia involves the island of thicker ice to the northeast of Wrangle Island. That was, late last summer, part of the “reef” which formed the southern boundary of the “Slot” of open water north of Alaska, and before that it was a sort of long and thin bulldozed pressure ridge towards the western Canadian Archipelago, formed as the multi-year ice plowed ahead through “baby ice”, and at one point it was roughly fifteen feet thick (dark red in the above map.) It is amazing the changes ice goes through, even when it retains a sort of identity. 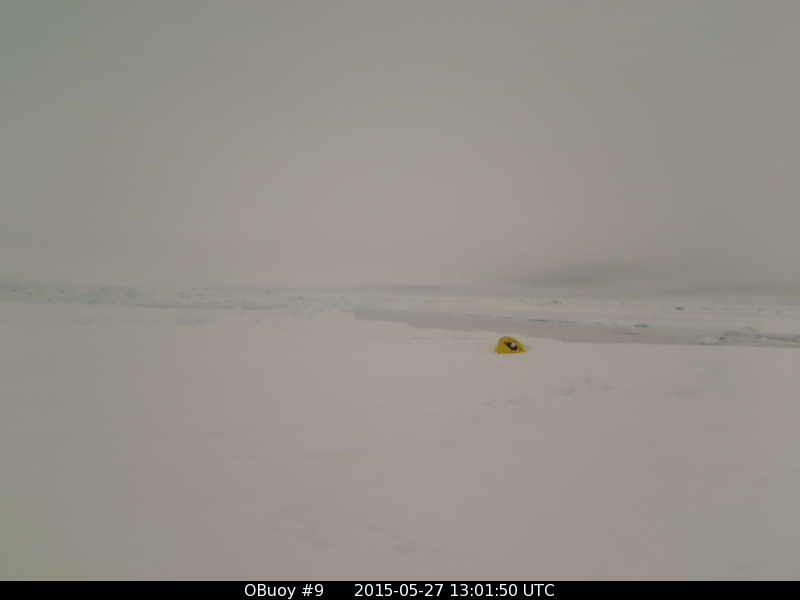 One thing you have to be ready for when watching the sea-ice is to be wrong. I’ve actually attempted to avoid ever expecting anything, to avoid ever being wrong, but the mind simply doesn’t seem to work that way. It notices patterns, and once you notice a pattern you expect it to happen again. Sometimes it does, and sometimes you are in for a surprise. Therefore I think I’ll stop using the word “wrong” and start using the word “surprised”. Here are the concluding DMI maps. The low stalled over Scandinavia looks like it will cut off the flow of Atlantic air over the Pole, and actually export air down over the Atlantic. That air, likely combined with the cold air being exported from Canada south of Greenland, ought give Western Europe the coldest sort of Atlantic air it ever gets. Meanwhile the drained Pole can start growing a new pool of cold. Below are The Dr. Ryan Maue maps from Weatherbell showing the GFS model initial run of temperatures for this morning, and then temperatures for 2 days from now. You can see some of the cold does make it down to the eastern USA (so I could claim my nudge-theory was “right”, if I wanted to spoil the surprise), however you can also see the core of the cold is hooking east towards Labrador and the Atlantic. And of course we need a map of the surprise storm roaring up west of here, giving the Great Lakes a pretty good blizzard, as we get a mild night and thunder like it is summer. As interesting as midnight thunder may be for me, it likely belongs more in a “Local View” post, and I should turn my eyes to Europe, and the waters north of there. Europe had a chilly dawn, though the air seems Atlantic, rather than east winds from Siberia. (pink is below freezing.) To the north the winds have shifted around to the north in Barents Sea, which may be spreading ice south rather than compressing it north, and explain (at least partially) the odd little up-tick in the ice-extent graph. For the most part winds have been south in Barents Sea this winter, and the Pole has been invaded by Atlantic air, making it above normal all winter up there. Barents Sea is pretty much wide open, and has been through a complete flip-flop over the past two years. I have the sense it is trying to show us something, but we mortals are too dense to get it. 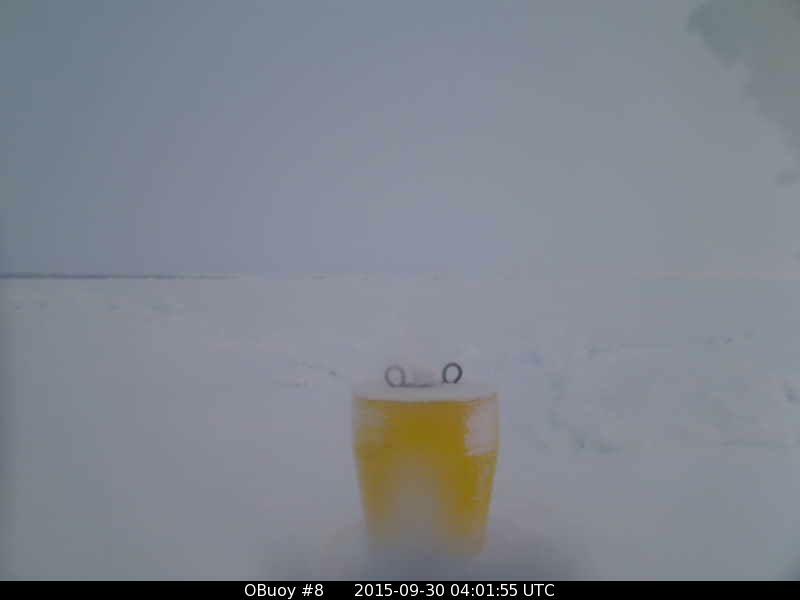 In any case, I think it will be the focus of my next sea-ice post. And jeered down, and looked up, and forgot the dark. Like the child’s ladder, though odds seemed doubled. As winter comes closer and shadows all lengthen. You’ll have to forgive me for waxing poetic to start this post, but I got off into an interesting tangent of thought during the sermon at church last Sunday. This often happens to me. Just as I forgot to pay attention to my teachers at school, and my mind went sailing out windows to clouds blooming in the sky, in church some idea in a sermon sends my eyes to the windows, which are stained glass lit by morning sunshine. Among other things, the sermon suggested a “saint” isn’t some person with a long white beard and a halo of shimmering gold, but is just an ordinary person who happens to believe that Truth is a good thing. I sort of like this idea, because it suggests that even a cantankerous anachronism like me could be a “saint”. However I didn’t like the next part of the sermon, which suggested being honest invited persecution. I have enough troubles without “inviting” any. However, as my mind went drifting off from the sermon into the colors of the stained glass, I had to admit that simply stating the truth about arctic sea-ice has earned me a lot of grief. People I greatly respect, members of my own family and church, have used that silly word “denier” on me, when I simply state a mundane fact about banal stuff called “sea-ice”. It seems more like a knee-jerk reaction on their part, than a deed involving one iota of actual thought. As I gazed off into the colors of the stained glass it occurred to me that perhaps civilization has made some progress over the last two or three thousand years. Back in the day, the authorities, and especially the Romans, physically tortured people who spoke Truth. Now the authorities only psychologically torture people who speak the Truth. Hey, it may not be pretty, but it is progress. If you study Roman times, the brutality of Roman authority stands out. When the Romans marched in, there was no talk about political correctness, it was a case of, “My way or the highway.” They thought nothing of slaughtering all the elders of a town, or all the professors of an university, or all the leaders of a government. 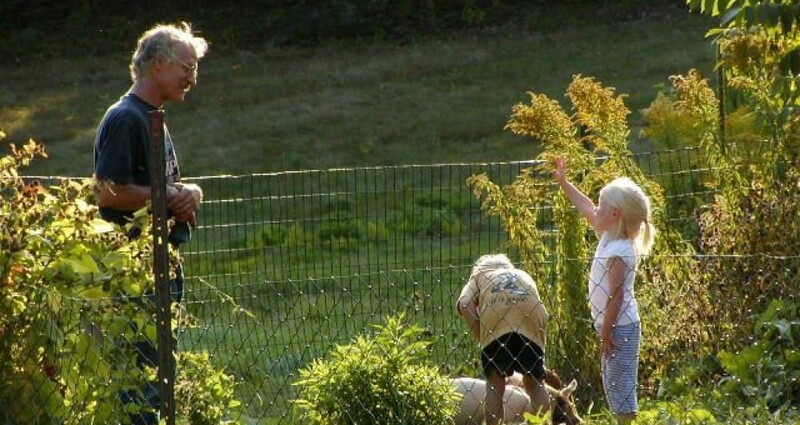 In fact they made their slaughter a spectator sport, feeding people to lions at the Colosseum. Physical cruelty was everyday, and Jesus Christ on the cross was no exception. The answer that leaped into my my head was, “To begin with, rather than throwing you to the lions, they throw you to the morons.” That made me chuckle aloud, at which point I figured I had better stop daydreaming, and pay attention to the sermon. Later, however, the thought came back to me, and I found myself wondering what makes a person a moron. I’m not talking about the fellow with an IQ of 60, who maybe drools a little. I’m talking about an otherwise intelligent person, with an IQ well over 100, who feels they somehow deserve the right to be indignant about a subject they have never studied and know nothing about. As a boy I was a moron, concerning the subject of New York, because I was a Red Sox fan after Ted Williams retired in 1960 and before Carl Yastremski led the Impossible Dream Team in 1967. Every year New York won the pennant and every year the Red Sox came in next-to-last, (which was ninth place back then), and I developed a foaming hatred towards New York. If anyone said anything good about New York I became quite indignant. I was actually surprised I wasn’t immediately mugged when I first visited the city, and astonished that I actually met kind and helpful people. The scales fell from my eyes, and I stopped being such a moron. I also dropped the right to be indignant, which was no great loss, for when I thought about it, being indignant doesn’t feel all that good. However it seems to me some people really like the feeling. They must, for why else would they spend so much time being indignant about this and indignant about that? And most especially, why would they bother to feel indignant about things they know nothing about? I mean, as a boy I might feel indignant of anyone who said anything nice about New York, though I had never visited the city and my knowledge of New York (beyond the Yankees) was nil, but I was just a boy and didn’t know any better. As you grow up you are suppose to know better. Some don’t know any better. They simply like to feel offended, I suppose, and I do my best to steer clear of them, the same way I steer clear of my rooster when his neck feathers stick out and he looks at me in an indignant manner. Fortunately, at this site, we don’t deal with big issues, such as the definition of marriage, or the point at which aborting life becomes murder. All we are concerned with is whether we are moving towards the next Little Ice Age, or the next Medieval Warm Period. Furthermore we have retreated far from the maddening crowd, to a landscape devoid of mankind, or even signs of mankind, except for a stray contrail in the sky, and perhaps a buoy, every five hundred miles. However I am sad to inform newcomers that, even when you retreat to a point this far from civilization, you may still find yourself a “saint” for simply stating what you see, and may even suffer a sort of psychological crucifixion for being accurate. All you need to do is state a Truth; for example: “The so-called ‘Death Spiral’ did not manifest during the summer of 2015”, and people may become extremely indignant. I don’t know why this particular rooster gets so indignant when I enter the stable, especially when you consider the fact I’m the guy who gives him grain and water. However I forgive him because, after all, he has a brain about the size of an aspirin. It is very painful to me to see my fellow mankind behave as if they have brains the size of aspirins, and to watch them become absurdly indignant about subjects they know next to nothing about. Even worse is the fact many get such a strange joy out of being indignant that they don’t want to learn more about the subject they know next to nothing about. When you attempt to patiently explain things, they sort of go, “La-la-la I’m not listening.” And that is the modern, psychological crucifixion of people who simply speak the Truth. They get thrown to the morons. I’m sorry to spend so much time explaining this phenomenon, on a site which for the most part is dedicated to simply watching ice melt, and then watching water freeze. However, if we are going to study the state of affairs, concerning sea-ice, it is important to know you will meet maddening, indignant roosters, for they are included in the state of affairs, concerning sea-ice, and they are also one of the shadows lengthening across our social landscape. It remains worth watching, even as the views become fewer and farther between, because you can occationally see some interesting events. One thing I have discussed is how leads can open up and expose open water even when temperatures are well below the melting point of salt water. 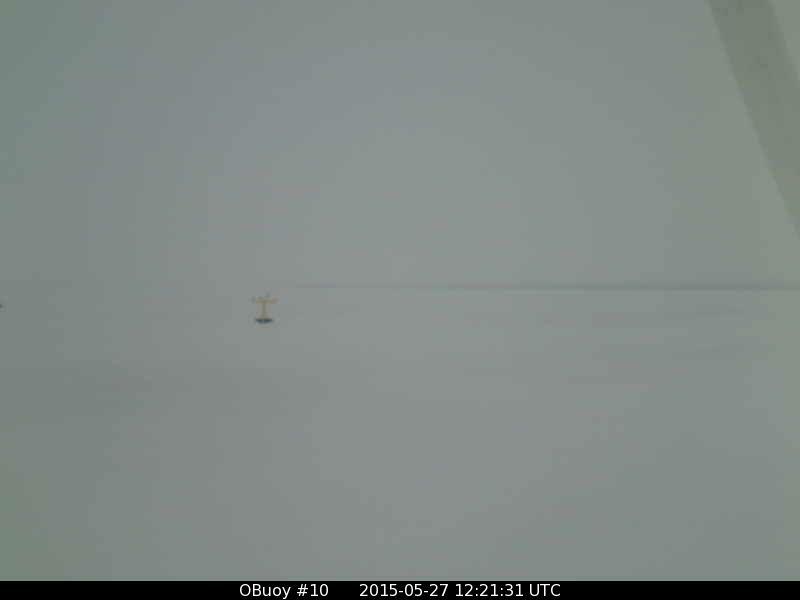 We saw this happen at O-buoy 8-b. I mentioned that such open leads can also slam shut, and rather than an open lead you see a pressure-ridge. 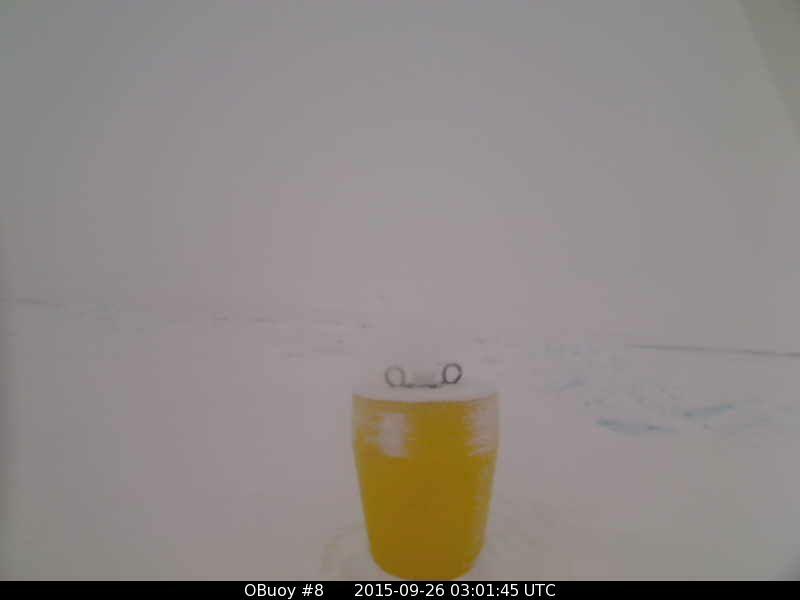 We saw this happen at O-buoy 8-b over the weekend, giving us a picture of how an area of open water or thin ice can become extra-thick ice (as we remember 9/10th of a pressure ridge is under water, as is the case with all bergs.) In a sense we have been privileged to see what usually is hidden by winter darkness, and have a sequence of pictures that would teach well on a textbook. Of course, having such splendid leads and pressure ridges so close to the camera is a bit like living right next to the San Andreas fault. The camera is at risk. 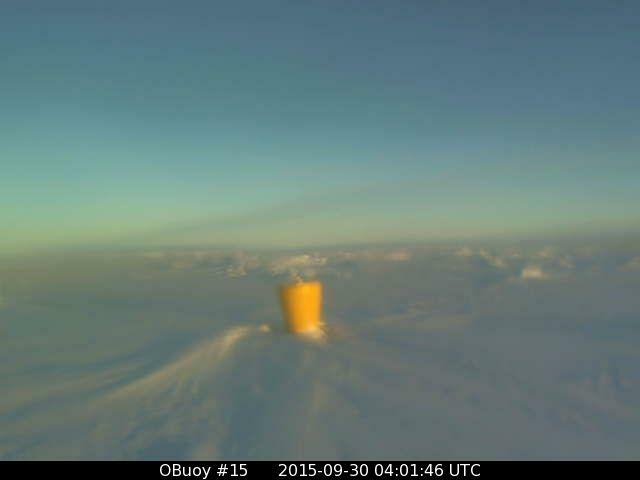 Today’s picture from O-buoy 8-b indicates some milder air is moving in, but is lifted by the cold air at the surface. Wet, sticky snow is falling, though temperatures remain low, down at -10°C. 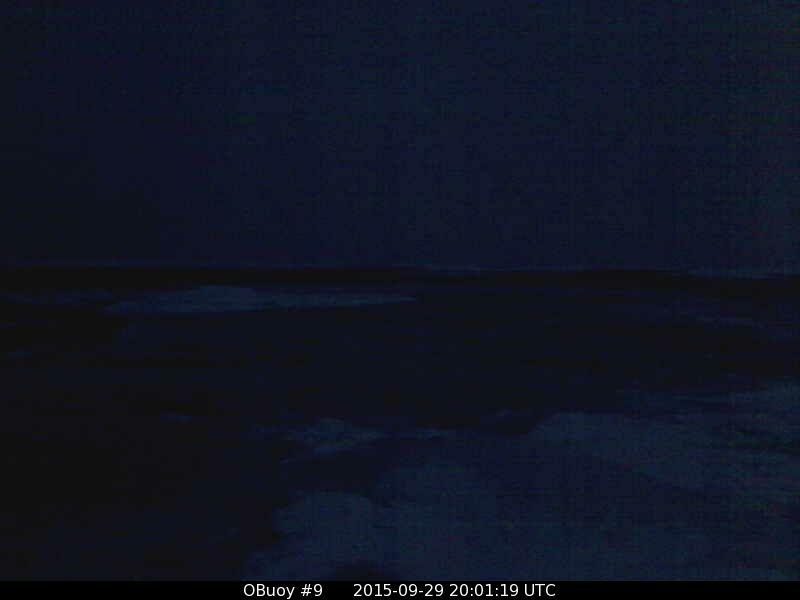 The invasion of mild air is much more dramatic over at O-buoy 9 at the north entrance of Fram Strait. Here we are seeing winds of 25-30 mph bringing a flood of Atlantic moisture and mildness north. 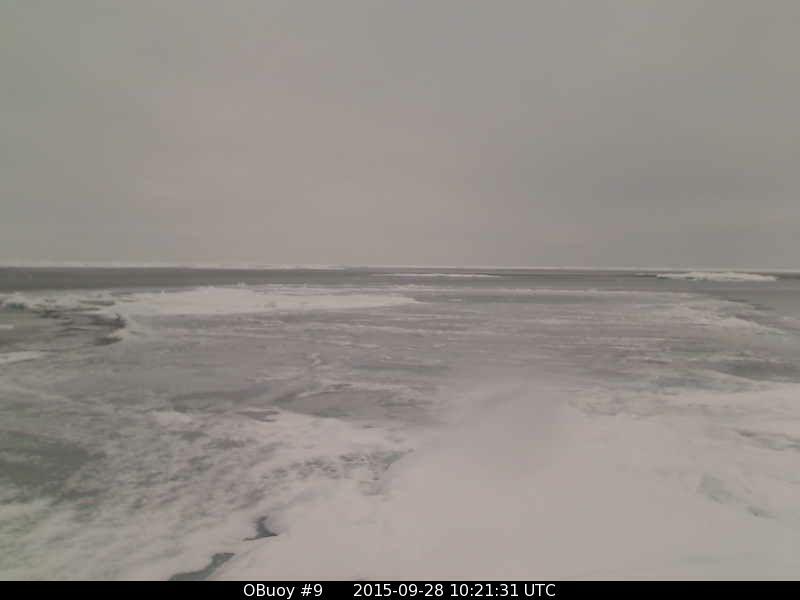 Also the sea-ice is being pushed back north in Fram Strait, which is unusual this late in the season. Fram Strait is the major exporter of sea-ice from the Arctic Sea, and such export is a major part of low levels of sea-ice. Now, if you are an Alarmist, and have a major emotional investment in seeing there be less arctic sea-ice, it is hard to know whether the current southerly gales in Fram Strait are good news or bad news. The ice being pushed back to the north is bad news, as it keeps the Arctic Sea loaded with last year’s ice. However the mild temperatures must be good news…or are they? Mildness and moisture makes more snow fall, on the ice, which would be “good” if conditions were calm, for the snow would insulate the ice and keep the ice from freezing. However, as conditions are not likely to be calm, the snow is likely to be blown from the ice into wind-created leads, forming slush which increases the amounts of ice, which is “bad”. I find it wiser to avoid the value-judgement of calling what happens “good” or “bad”. Whatever will be will be. Furthermore, it is the Truth, and Truth is a good teacher. They say history repeats itself, but I can never recall seeing such a wrong-way gale in Fram Strait after the solstice. This is a new one, for me, and I think it is wise to sit back and learn. 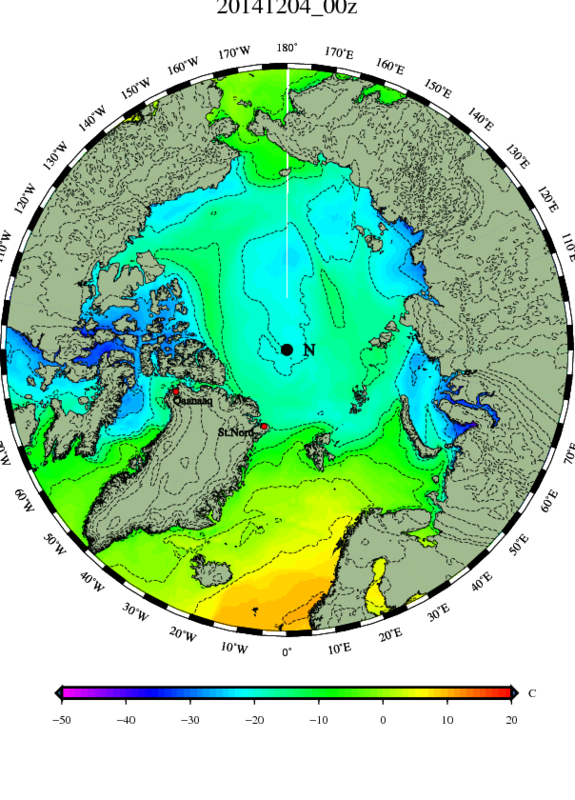 Someone said that Harry Truman once stated, “The only thing new under the sun is the history you haven’t read.” However we don’t have all that much history to read, concerning the arctic. We are newcomers. And when you have no history book to read, you need to sit back and watch the present tense make history. While I do believe history repeats itself, and that meteorologists who search the past for analogs can do wonders, I also believe no two snowflakes or fingerprints are alike, and there is something eternally fresh and new in every sunrise and in every weather map. Therefore I watch the current surge in Fram Strait with great interest, fully expecting to see something I’ve never seen before. 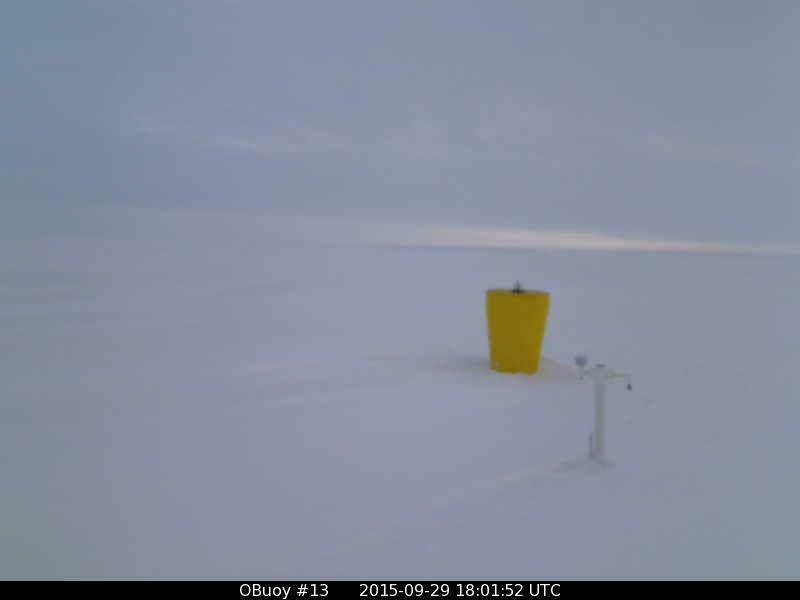 The view from O-buoy 9, at the moment, is rather dull, gray, and even slushy. I notice “Lake Faboo” is buried under the new snow, but as is usually the case in the arctic, the snows are not all that deep. In the few places where records are kept, I notice now is the most snowy time of year, but the snow amounts are only an inch or two. At other times the monthly amount is barely a half inch, or even less. The arctic is a desert, in terms of precipitation. When you talk of a half inch of snow per month it is like talking about five hundredth of an inch of rain in an entire month. You will hear a lot of talk, from various people, about how snow insulates the ice and the water under the ice. It is important to remember we are not talking about snow that you wade hip-deep through, but rather ankle-deep stuff. When the winds howl, often the ice is blown clear of snow. 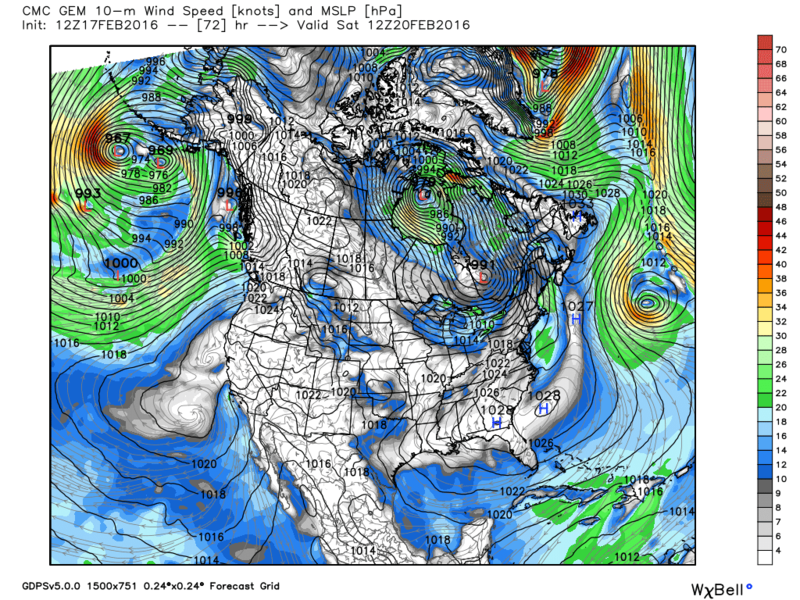 In order for winds to howl what is called a “meridional flow” is needed. What is called a “zonal flow” is more neat and tidy, and more according to textbooks. Textbooks like to talk about the “Polar Cell”, and place a high pressure at the Pole, with well-behaved lows rotating around it, with the air rising in the lows and sinking in the high pressure centered on the Pole. This is elegant and tidy, but a meridional flow makes a total mess of it. Floods of warm air surge right up to the Pole, and fuel low pressure right where the textbook states we should have high pressure, and air rises right where the textbook states it should be descending. We are likely to see a splendid example of this, the next week. When a zonal flow places high pressure over the Pole, conditions tend to be quiet, as calm often occurs under a center of high pressure. 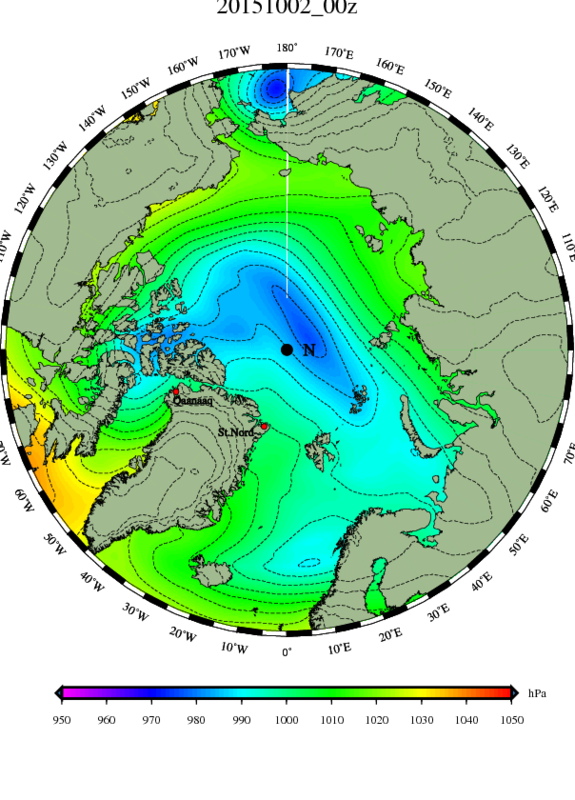 However a meridional flow creates storms, and winds smash and crash the sea-ice. Rather than ice and snow sheltering the water, ice splits and leads, sometimes ten or twenty miles across, open up, and the sea is exposed to bitter winds. 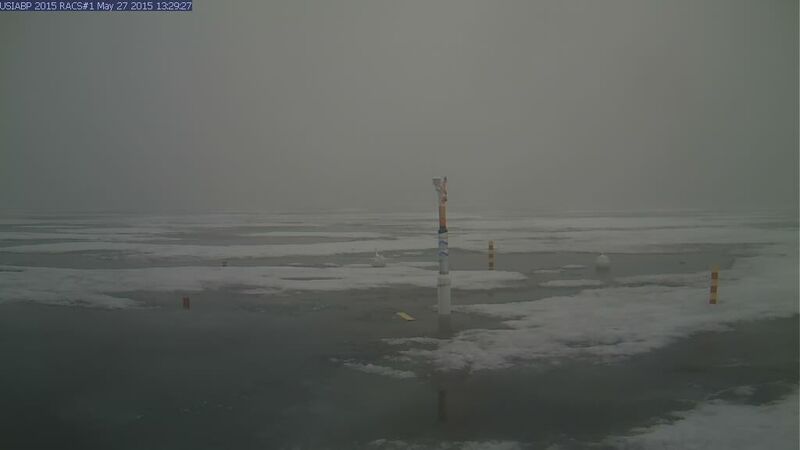 Not only is the water chilled more, but more ice forms on that open water than would be formed if the water was protected by a yard or two of ice. Air temperatures may be higher, as the open water loses heat to the air, but that heat can only be lost to outer space in 24-hour nighttime. All in all, IMHO, a meridional flow is far more conducive to building the volume of sea-ice. So let us sit back and watch as the atmosphere does its dance. In the maps below we see the feature ESib1 has been flung from Bering Strait across northern Alaska to the east side of Hudson Bay, as its Fujiwhara-dance partner FG4 got left behind and whirls north of East Siberia. I should be paying more attention to that, but only have so many brain cells. What grabs my attention is the ridge of high pressure sliding east across the Atlantic and the low forming off northeast Greenland, which I’ll call “FG5”. Between them is the remarkable “wrong way” flow in Fram Strait, and the warm flood toward the Pole. 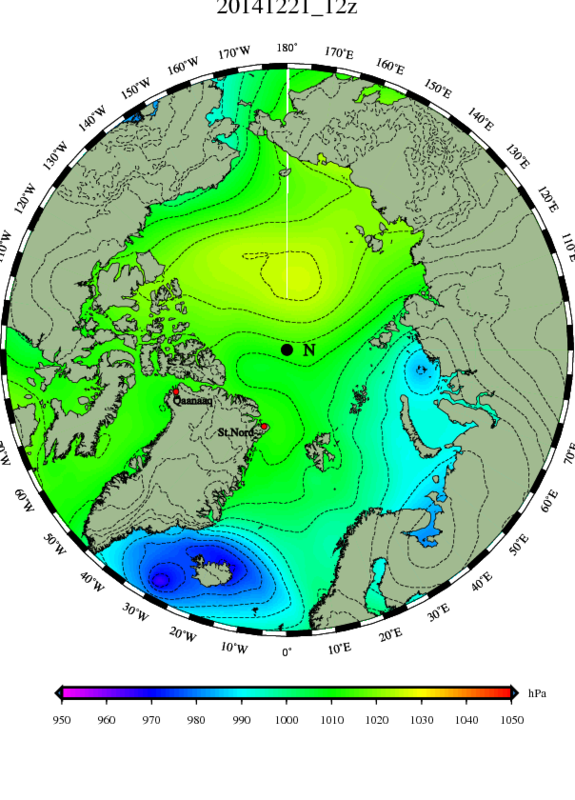 As that warm air hits the cold air it is bound to fuel a frammerjammer, and the flow in Fram Strait could swing right around for a while. “FG5” looks like it might be an interesting storm, and briefly be king of the mountain, riding high atop the entire planet Earth. 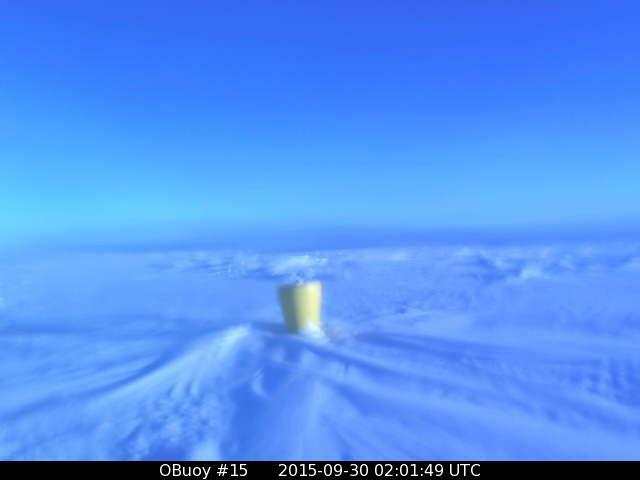 The buoiy is roughly at 78.5° N, 141° W, which is south and west of O-buoy 9 in the Arctic Basin. (I’ll call it a Beaufort Buoy because that so obviously irks nitpickers.) Temperatures are around -5°C and winds fairly strong around 25-23 mph. Considering there was little sign of that gale this morning, the above example is a fine example of what happens when you mix warm and juicy south winds from the Atlantic with bitter cold from the arctic. 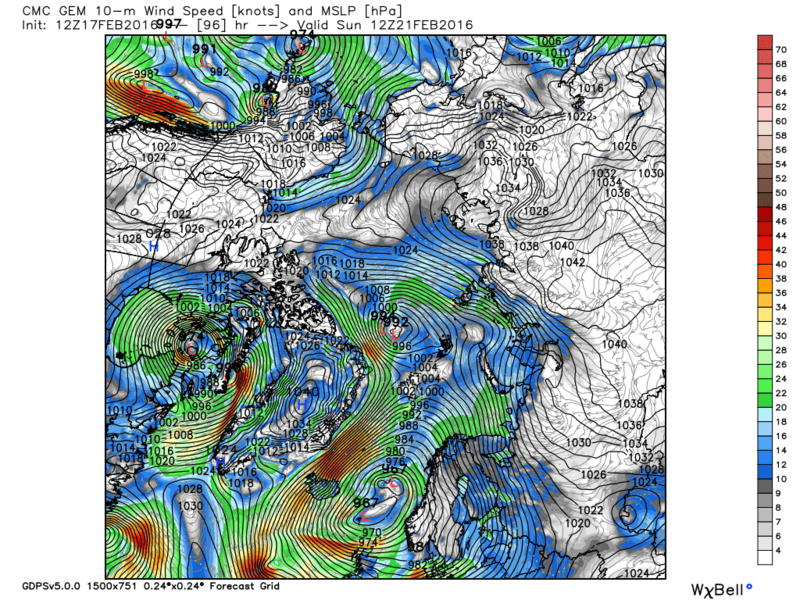 The isobats suggest the winds are really howling off the coast of Norway, but haven’t picked up in Fram Strait. However this map is actually from noon, and by afternoon the north-moving ice was lurching back to the south, which is more normal for this time of year. Across the Pole ESib1 is a decent low, adding to the fact that uplift is occurring over much of the arctic, which sure makes a mess of the textbook defination of “The Polar Cell”, as an area of decending air. 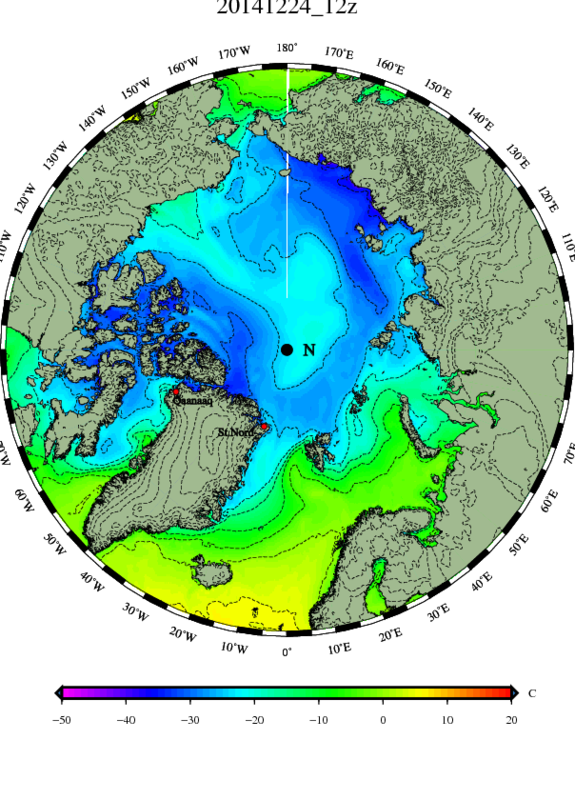 Yet all this uplift must go somewhere, and the powers-that-be can’t send the air further north as a Ferrel Cell does, as there is no such thing as further north at the North Pole. It is a test to our ordinary thinking, which tends to be zonal, and see weather systems parading around the globe from west to east. At the Pole, I sometimes think, the weather simply goes up and down like a yoyo. When all the uplift has no place to go it just comes crashing back down, turning low pressure into high pressure. And before you laugh at this idea, check out the computer models, and notice that where FG5son is a sub-960 mb low tomorrow the maps show it swiftly fading, and being replaced by a 1040 mb high pressure system. It will be interesting to watch, as will be what happens to the temperatures. Currently it is much milder than it has been. 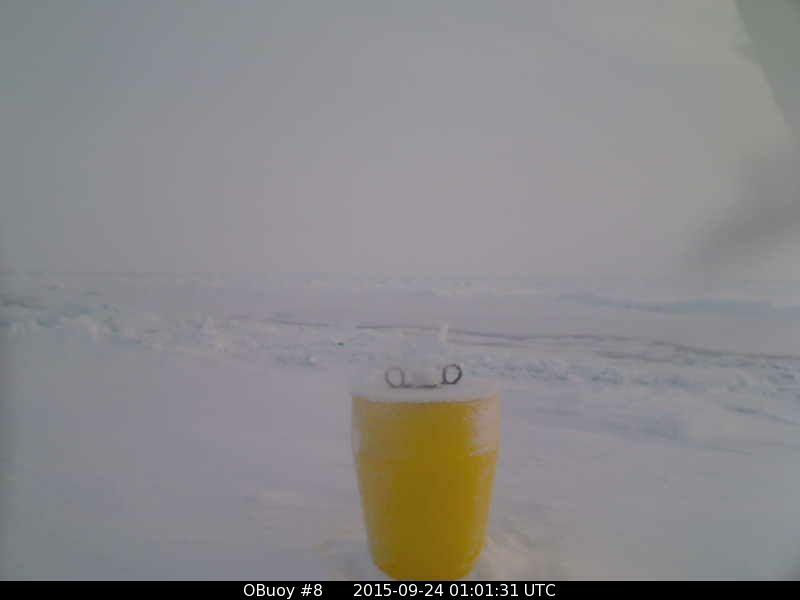 On September 25 Faboo drifted 4.35 miles south east in very light winds to 84.728°N, 8.772°W and saw temperatures fall steadily, crashing to the low of -17.4°C at 1800Z, before rebounding to the period’s high of -10.8°C at 2100Z. 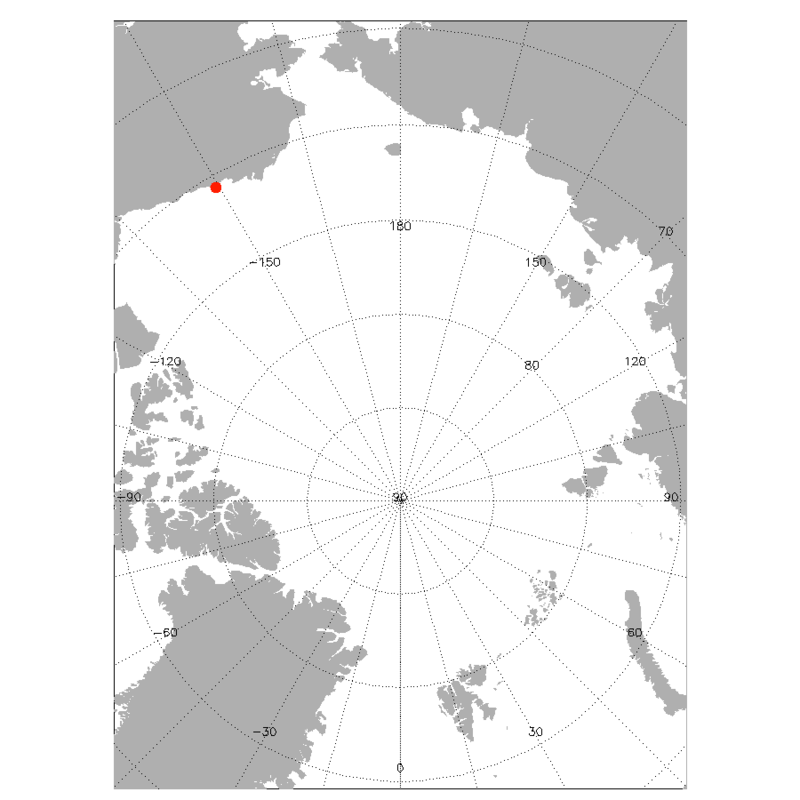 On September 27 Faboo reached its most southerly point at 0300Z, at 84.678°N, and its most easterly point at noon, at 7.510°W, before deversing back to the north and west and finishing the day at 84.752°N, 7.542°W, which was 5.03 miles the “wrong way”. 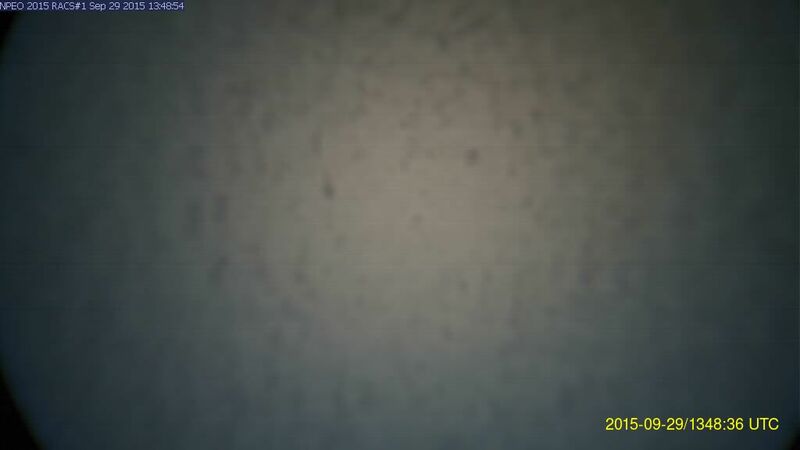 Temperatures fell to a low of -18.2°C at 0600Z before recovering to -9.4°C at the end of the period. The breezes grew stronger, up to 15-20 mph range. On September 28 Faboo again returned to moving east, but continued north to finish at 84.876°N, 6.452°W, which was another 15.76 miles the “wrong way”. 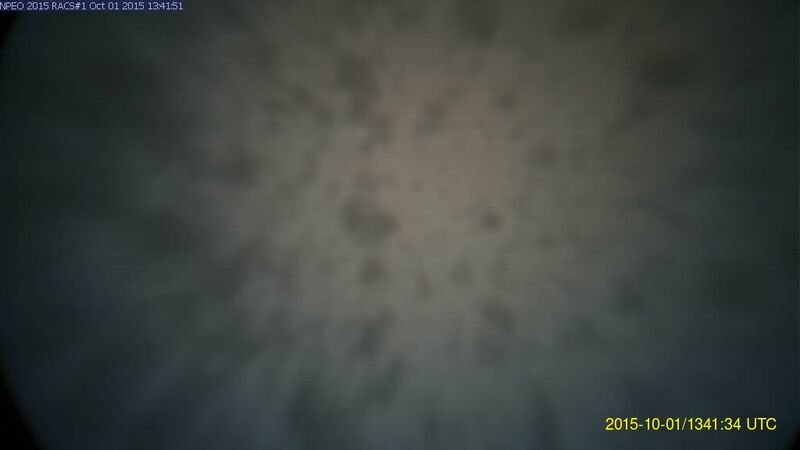 Temperatures rose from -9.3°C at midnight to a balmy +1.0°C at 0900Z. 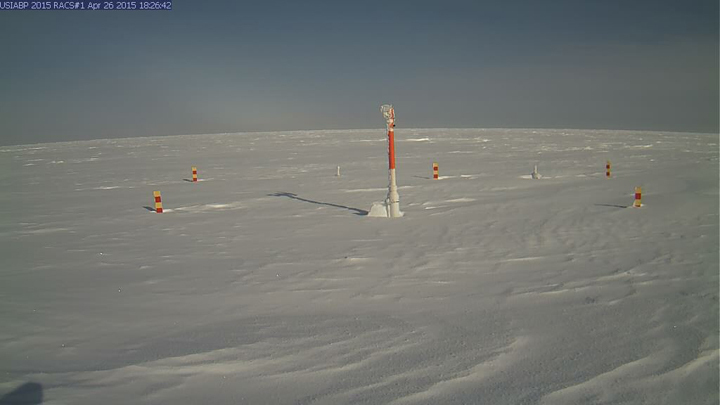 After dipping to -1.8°C at 1500Z, a second thaw was experienced at the end of the period, with temperatures at +0.5°C. Winds peaked early, with a steady blow of 27 mph, before slacking off to 15 mph. 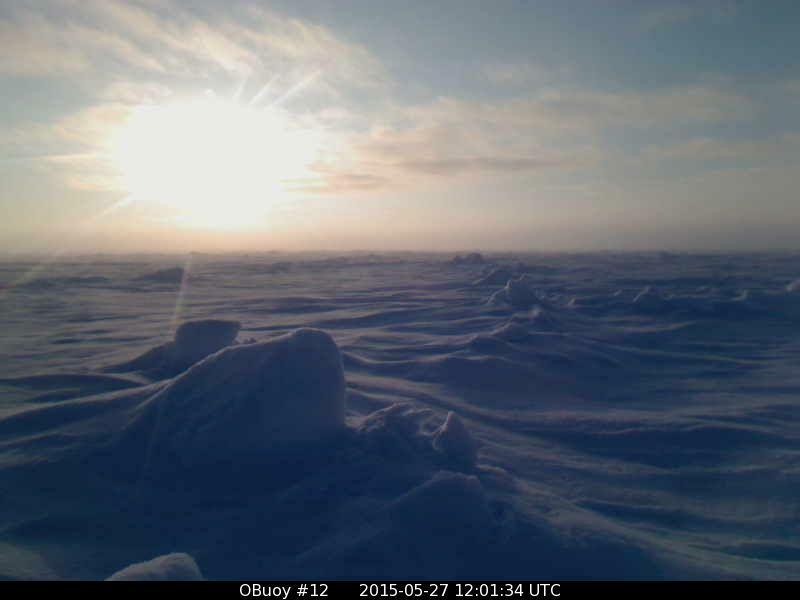 Unofficial reports showed we continued north for a while today, but then headed south, as temperatures fell. Unfortunately freezing rain was involved. It is my experience that this stuff is hard to melt from the camera’s lens. I’ll try to play catch-up later. It is hard to run a decent blog when pulling double shifts. 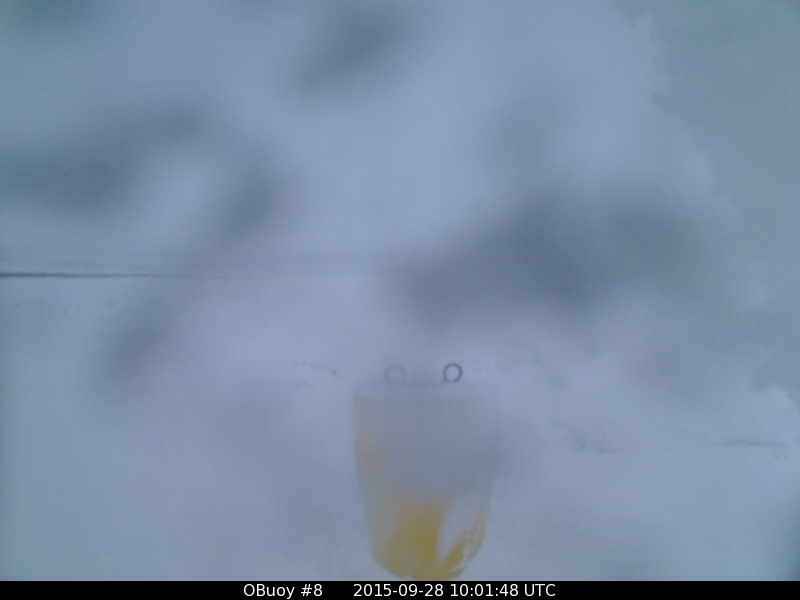 It is also hard to focus on sea-ice when a hurricane is milling about to your south. On September 29 Faboo continued northeast as far as 84.904°N at 0600Z before a 180° wind shrift hit, dropping temperatures from +0.5°C to -7.0°C at the next report at 0900Z. 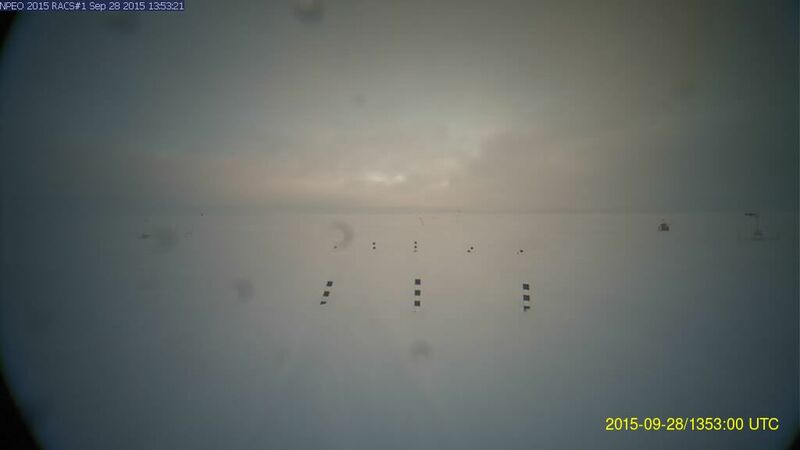 Winds picked up from 11 to 17 mph as temperatures fell to -13.2°C as Faboo moved 3.49 miles southeast to finish the period at 84.826°N, 6.363°W. 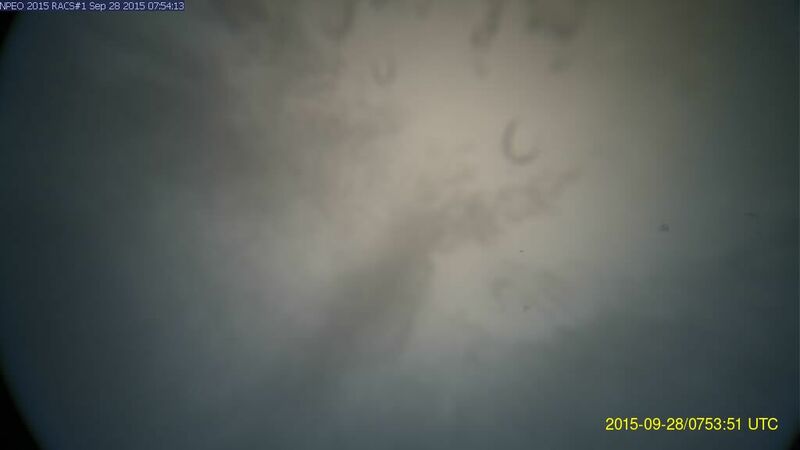 Yesterday temperatures slowly rose from -13.2°C to -10.2°C as winds climbed to a steady gale-force blasting of 36 mph, grinding the ice 17.6 miles SSE to 84.574°N, 5.923°W. Quite a mild stream of air has been pulled east over the Siberian Side, as the cold is reduced to a pool north of Canada and Greenland. I expect the cold to expand as the gale weakens and fills. Temperatures are at -10°C and winds at 4-7 mph. If the recent gale didn’t smash this ice up, nothing will, until it gets further south. I apologize for being unable to properly withdraw from life and enjoy the pleasures of escape to the arctic. Sometimes life won’t let you escape. Time and tide and arctic sea-ice wait for no man, and a lots been going on I haven’t had time to talk about. A veritable flood of milder air came north with low pressure and made the Pole an area of uplift, which drew more air north at the surface. A lot of this “air” was water vapor, which went from taking up a lot of space as vapor to taking up very little space as a drop of water or an ice crystal. Therefore there does not need to be as much outflow aloft as one might expect, with all the inflow. They say what goes up must come down, but this is not true of the Pole. Water vapor goes up there and does not return, and heat goes up there and is lost to outer space. Once the sun sets the Pole is like a chimney for the planet, and what we have just seen is stuff heading up the chimney. 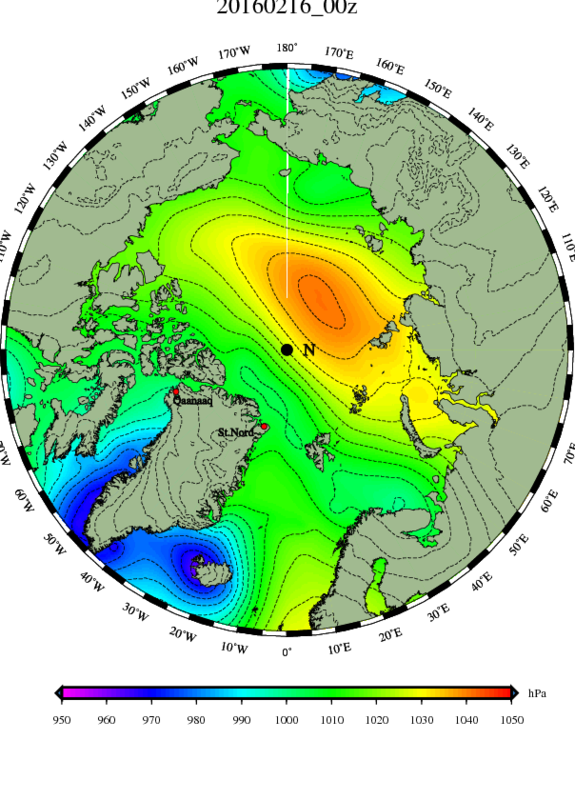 That being said, when a mild surge heads north for the Pole I often look for an south-bound arctic outbreak somewhere else, and indeed there were two decend surges of cold into eastern and western Siberia, as well as a snowy spell in Alaska that drew notice. Even as milder air floods the Pole, snow-cover is building on the tundra in Siberia, Alaska and Canada. This will assist the creation of cold air through radiational cooling, and result in the Arctic ocean being frozen by south winds from the tundra. However one interesting feature is that swath of snow northwest of Hudson Bay, as much of it is well south of the actual coast of the Arctic Sea. This tendency also shows up in a Dr. Ryan Maue map posted on Joseph D’Aleo’s excellent blog, of the the deepening snow in Western Siberia. Much of the snow is well south of the actual coast. In conclusion, we have a situation where we have a cold circle of ice atop the globe, surrounded by a larger circle of milder coastal waters, surrounded by an even larger circle of cold tundra. Until the coastal water freezes, the situation is wonderfully unstable. The current temperature graph for areas north of 80° shows the current surge of mild air past its peak, and about to begin what I suspect will be a steep plunge. 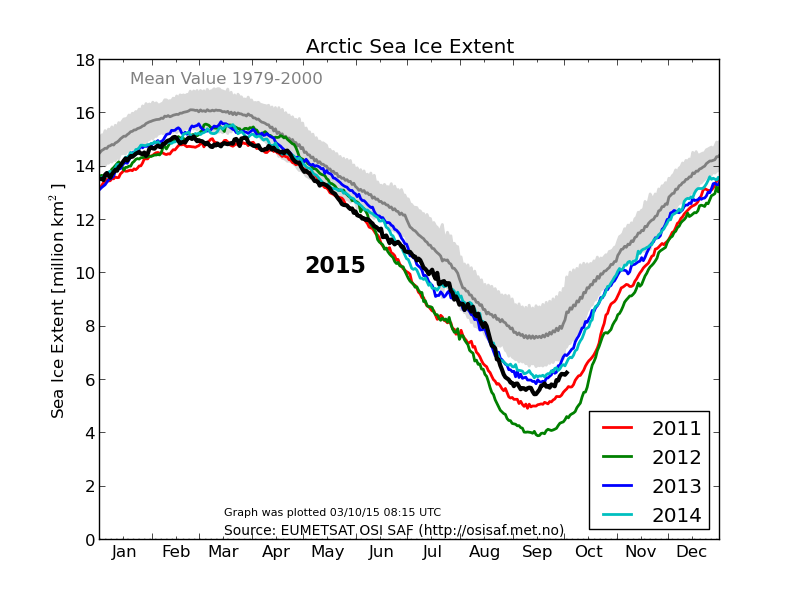 The ice “extent” graph shows the mild surge did slow the refreeze, but couldn’t halt it. Most of our surviving buoys did show the milder air reaching across the Pole to Beaufort and Chukchi Seas, and the pacific side of the Central Arctic Basin, as the Atlantic and Siberian side haven’t experience the early season cold as much, and continue fairly mild. Yet the temperatures only briefly could thaw, in only a few places, and rather than thawing there was falling snow and freezing rain. Most of the slow-down in the refreeze was due to bottom-melt having a chance to occur without much upper-freezing, and also gale force winds smashing up the new baby-ice. 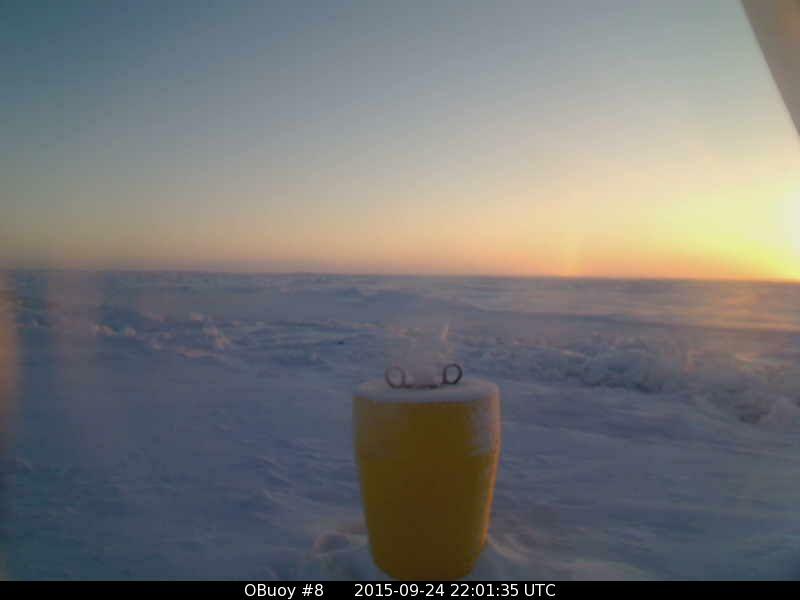 It is unfortunate that O-buoy 10 got crushed (or perhaps retrieved by an icebreaker) as we have no eye down in the Beaufort Sea “Slot”. The NRL concentration map suggests the southern “reef” of the “lagoon” got dispersed by the gales, though we cannot tell if the water still has ice and slush in it once everything gets wet, as it doesn’t show up well to satellite sensors. If the reef reappears during the refreeze we will know it wasn’t fully dispersed. I’ll download some pictures from cameras, and catch up on Faboo’s doings, in the morning. The last two weeks has been interesting to watch, though the growth and extent of the ice is fairly normal. Here are the extent maps from December 12 (to the left) and December 27 (to the right). As Hudson Bay and the Bering Strait have frozen up, most of the growth in ice from now on has little to do with the Arctic. You could almost call it cosmetic. It will be occurring in the Pacific, or the mouth of the Saint Lawrence River, or the Baltic Sea, and therefore will be fleeting, and have little to do with the Arctic Sea itself, which is what all the fuss is about in the summer. I tend to watch the arctic ice-thickness maps, which can give you an idea where the ice is moving. It moves far more than many imagine. For example, hundreds of square miles of thicker ice that had been lodged north of Franz Josef Land was shifted west by storms and crashed into the north coast of Svalbard, over the past month. This created a sort of polynya of open water where the ice had been by Franz Josef Land, which swiftly froze over and became thin ice. Watching the thickness maps allows you to see where the ice is piling up and where it is thinning, and gives you a rough idea on the total volume of ice up there. There are many interesting processes occurring that you seldom read about. For example, the same strong winds that blew the ice away from Franz Josef Land also blew the ice away from the south coast of the Kara Sea, and you can see that ice as thin blue lines of thicker ice now out in the middle of the Kara Sea. Ice really piles up on the west coast of Baffin Bay, and grinds southeast along that coast and then along the coast of Labrador towards the North Atlantic. Ice also can pile up on the south and east coast of Hudson Bay, while the north coast can see polnyas form, so that even though the north was the first to freeze and the south was the last to freeze, by spring the south has thicker ice than the north. Lastly, ice can be seen piling up just west of the Bering Strait on the north coast of Russia; last year this ice was piled up 20 feet thick there by spring. 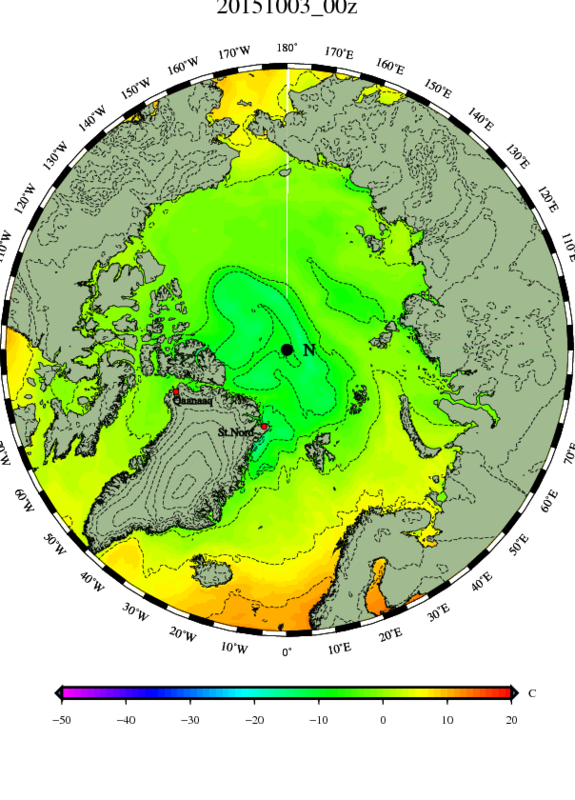 Watching the thickness maps brings many surprises, especially when storms wrack the ice. In the dead of winter, with temperatures at -40°, I have seen leads of open water form that are scores of miles across and hundreds of miles across. The open water freezes to thin ice almost immediately, but sometimes you can still see signs of that thinner ice months later. In a similar manner storms had a lot to do with the build up of thicker ice north of Canada. At times the thick ice can crumble and be spread out into open waters, and mess up all sorts of neat calculations in the process. Where a cold current often sinks when it meets a warmer current, and more saline waters want to sink beneath more brackish waters, it is physically impossible for the ice to sink, and it bobs merrily onwards on top, often significantly chilling both the temperatures of the surface waters and the air, until it melts away. Therefore a strong wind transporting ice south can alter temperature maps with startling speed. I imagine there are times when such alterations make a difference in the forecasts generated by computer models. They may even explain why the models utterly failed to foresee the cold that slumped south onto Europe recently. Just as it only takes a single pebble to start an avalanche, a single miscalculation can mess up a computer model. 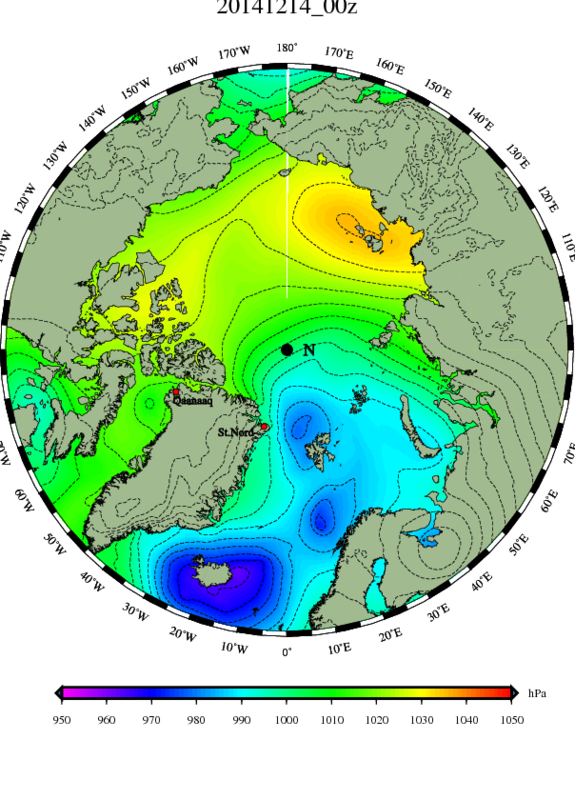 Although the models did not see the cold coming, Joseph D’Aleo and Joe Bastardi on their blogs at the Weatherbell site did say we should be on guard for cold waves to hit Europe, as the autumnal patterns were similar to years in the past that saw cold waves hit Europe. They didn’t explain how it was going to happen in a step-by-step way, so I watched very carefully to see if I could see the steps as they occurred. Back on December 12 we were seeing south winds bring warm air flooding north over Scandinavia, as the Atlantic storms veered north towards the Pole. 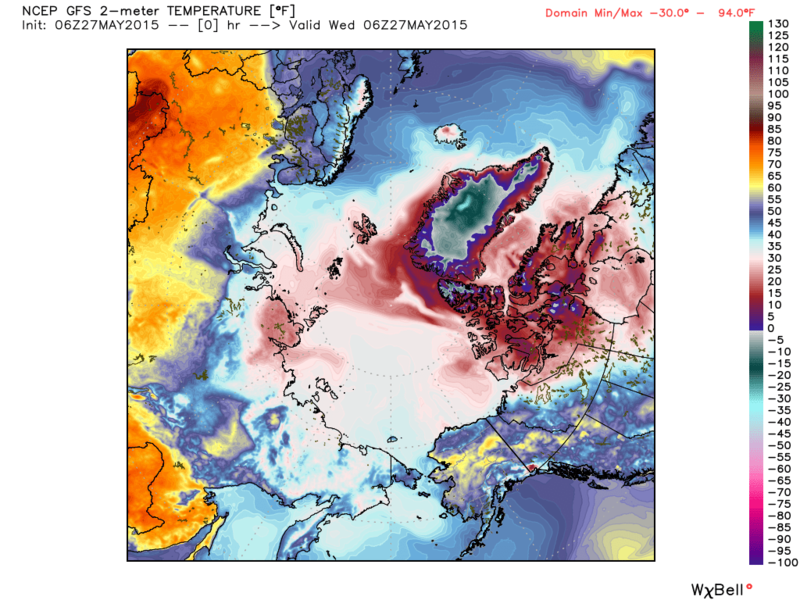 A lot of Barents Sea was above freezing. Cold air was exiting the Arctic down the east coast of Greenland. By December 19 the storms were no longer heading up to the Pole, but were moving east along the north coast of Russia. Barents Sea was cooling down, and to the east of the storm cold Siberian air was drawn up over the Arctic Sea and then dragged back west, and the milder Atlantic air lost its influence over the Pole. By December 21 the new storm track had the east winds to its north starting to drag cold air back towards Scandinavia. 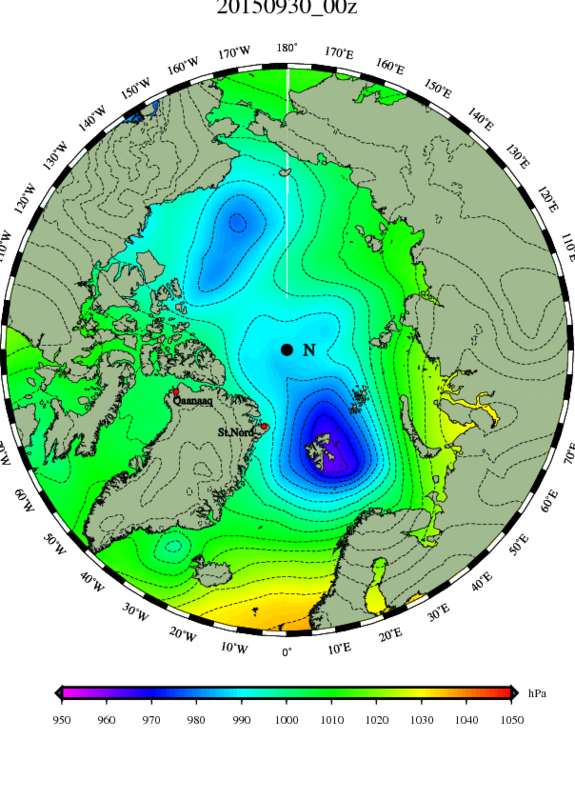 The following Atlantic Gale didn’t bring such a flood of warmth north. By December 24 the new storm track had penetrated weakly to the Pacific side of the Pole, and chilled Pacific air was being drawn over the Pole, but was too cold to warm the Pole much, and the cold air over the Pole was heading south to Scandinavia, and below freezing temperatures seeped down the coast of Norway. By the 26th of December the cold was building over the Pole, and the strongest low pressure was east of Scandinavia, transporting Siberian air back west over its top towards a Barents Sea that was now far colder, especially to its north. 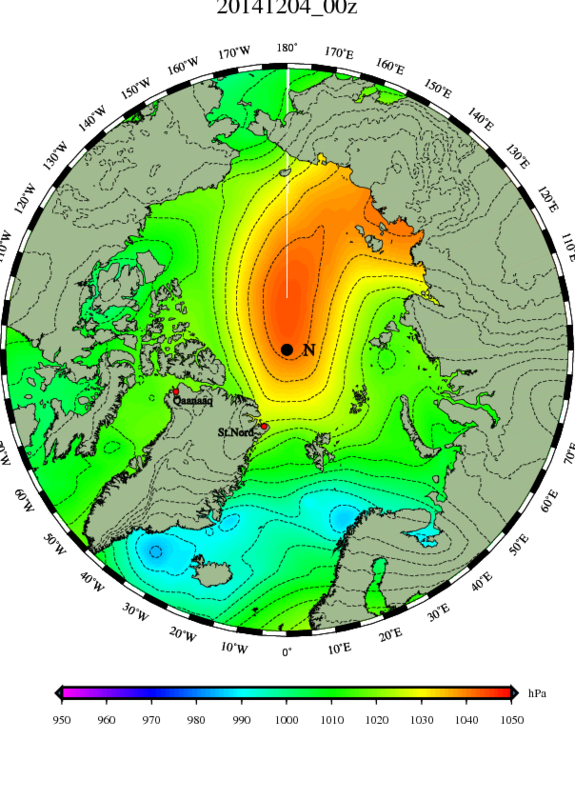 The Pole was as cold as it ever gets, except on rare occasions, and the weight of that dense air was spreading out, including down towards Europe. Today we see the following North Atlantic low is weak, without a surge of southerly winds, and the isobars hint of a discharge straight from the Pole to Scandinavia and areas further south. This afternoon’s map shows the weak low bringing snow to Britain and the cold continuing to press south over Europe. 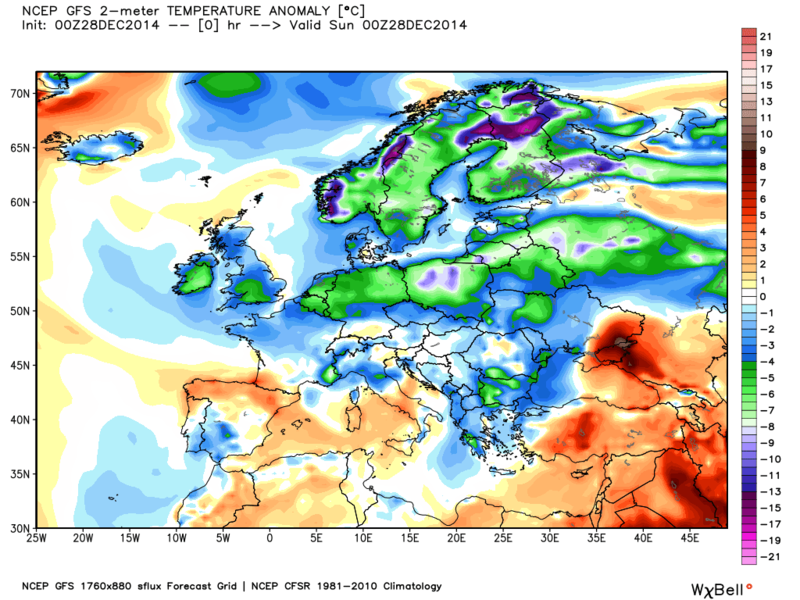 The computer models didn’t see this cold coming, even a few days ago, but now much of western Europe is below normal. As this cold continues to press south it is likely create elongated high pressure west to east. There may be a warm-up over Scandinavia as winds turn west to the north of the high pressure, but east winds to the south of the cold high pressure will bring very cold Siberian air further and further towards the Mediterranean, and a southern storm track will bring snows to Italy and perhaps even the north coast of Africa, before the cold is moderated. 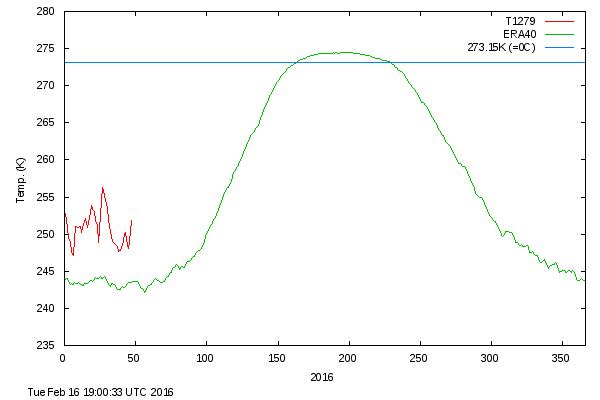 However I have no business talking about Africa in a post about the Arctic, so I’ll just show the graph of temperatures north of 80 degrees latitude, which informs us the arctic is loaded with midwinter cold, and has plenty to spare. Besides dumping cold down on Europe, some is being dumped south into Canada and the western USA. The thing to remember is that not only the Pole creates cold, but all areas of Tundra and Taiga generate cold as well, during these shortest of days. Better look for where you left your mittens. Here are the maps for November 29, (left), and December 12 (right). The increase in ice is pretty much as to be expected. What I am focused on is slight differences from the norm, that may hint at changes in cycles, whether they be short term weather patterns or longer term 60 year cycles involving the AMO or PDO. 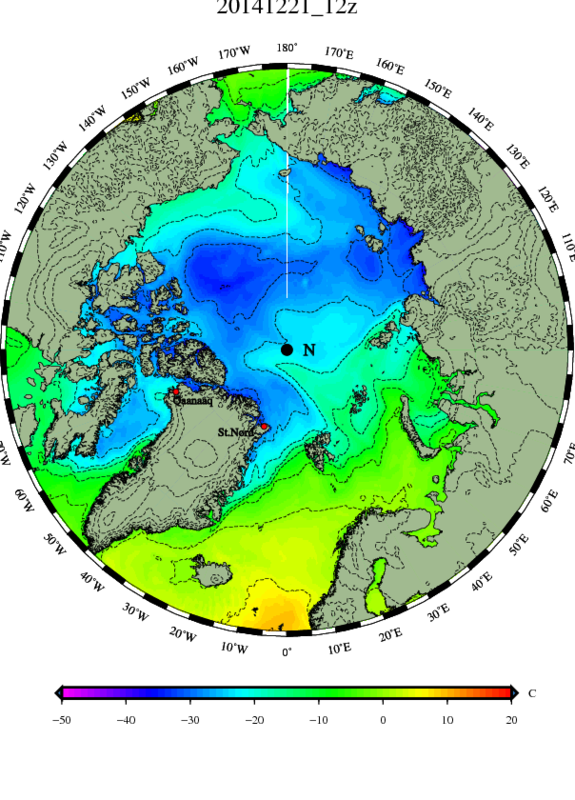 The swift freeze of Hudson Bay is ahead of normal, and of concern to me because the open waters of Hudson Bay to New Hampshire’s north is a buffer against the full brunt of arctic discharges. As soon as Hudson Bay freezes we are more susceptible to pure arctic outbreaks from due north. 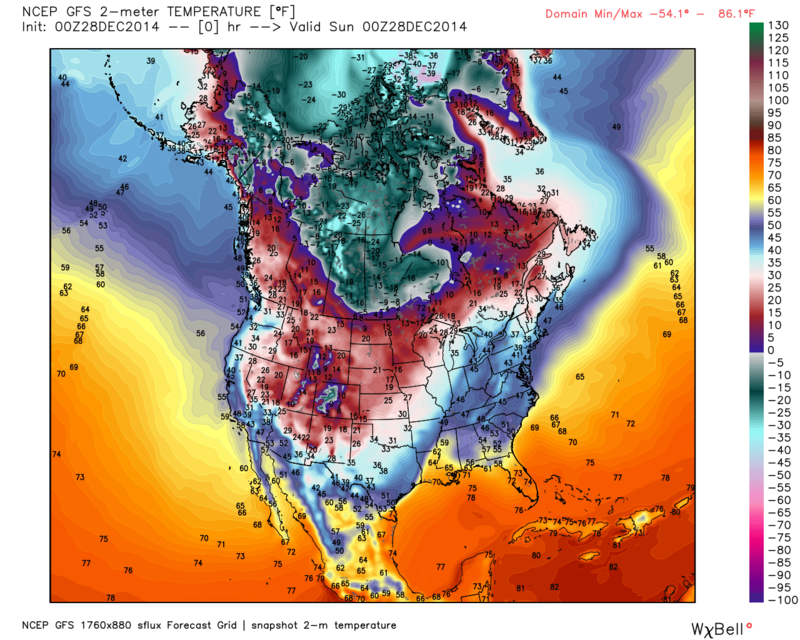 If the Great Lakes freeze we are more susceptible to cold from the Canadian prairie as well. To my east, even though the Atlantic does not freeze outside of the bays, its waters can be signifigantly cooled by the right conditions. 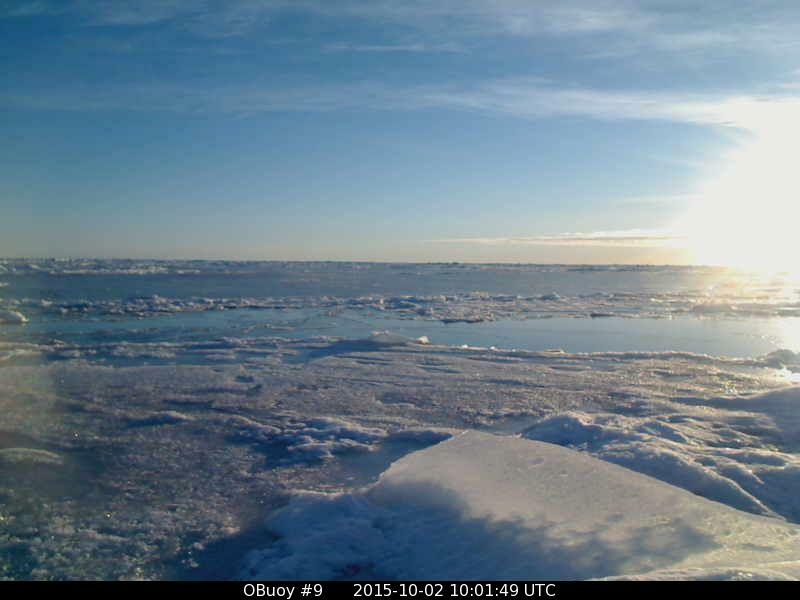 One such condition involves the discharge of ice from Baffin Bay, which is a great producer and exporter of ice. Even in the dead of winter when temperatures are down near forty below, open water can appear in the north of Baffin Bay, because so much ice is exported down the west coast of the bay that a polynya forms in the north. That ice then continues along the coast of Labrador, and icebergs continue down into the entrance of the St Lawrence or even further. The flow is far more complex than you’d think, as currents can dive down beneath milder waters, but in general there is a counter-current to the south hugging the American coast, as the Gulf Stream surges north. A second discharge of ice comes down through Fram Strait, down the east coast of Greenland towards and past Iceland. 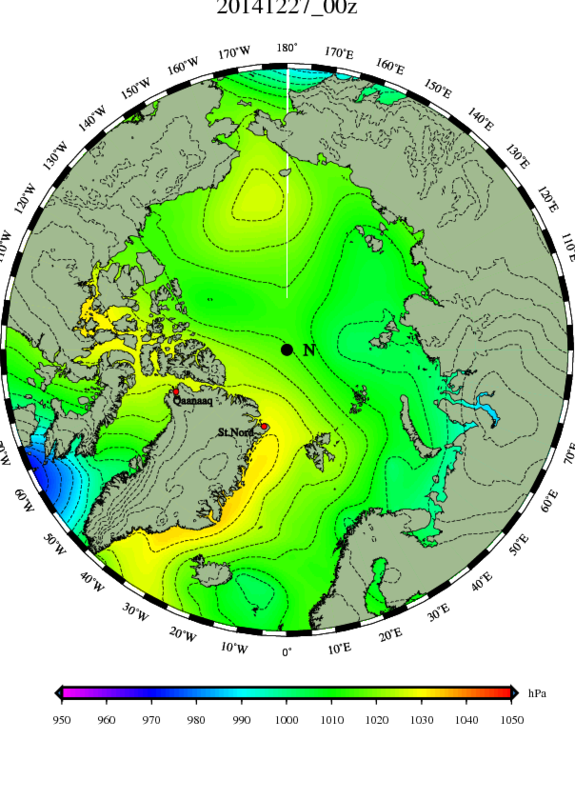 The ice in this current cannot dive even when the current’s water does, and therefore ice floats onward and effects the temperature of the North Atlantic. In extreme cases (1815-1817) so much ice is exported that icebergs can ground on the coast of Ireland, and Europe’s summer temperatures can be cooled. While nothing as dramatic as 1815-1817 has occurred recently, I do like to keep an eye on the discharge of ice, and utilize a layman’s assumption that less discharge may make Europe warmer, while more may make Europe colder, the following summer. This past autumn the ice-export down the coast of Greenland, and also down the west side of Baffin Bay, were below normal, but recently the extent has increased to near normal. This represents a surge or pulse of ice that bears watching, IMHO. On the Pacific side of the Arctic there has been an impressive increase of sea-ice in the Chukchi Sea north of Bering Strait. It is still below normal, but is closer to normal. I like to watch this area for two reasons. First, once it freezes over Siberian air can remain cold when it takes the “short cut” route from Siberia to Alaska, and second, it gives hints about the current nature of the PDO. The PDO has been in a short-term “warm” spike midst a long term “cold” phase, so I would expect ice in the Bering Strait to be below normal, but ice will increase as the short-term “warm” spike ends. There are past records of “warm” spikes during the “cold” PDO, however this is the first time we’ve been able to watch it with the detail satellites allow us, so of course I’m watching with great interest. 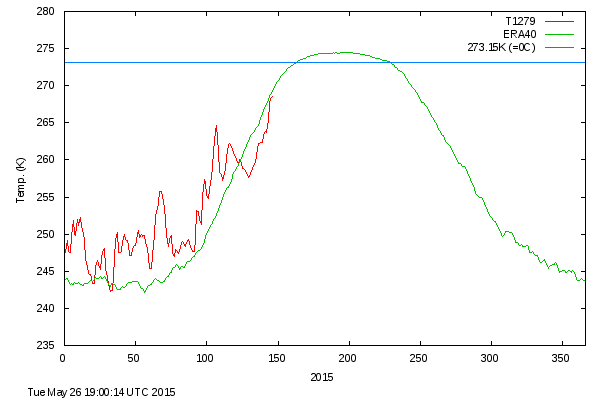 At this point the arctic is pretty much completely frozen over, and my attention turns to how the ice is being pushed around up there. 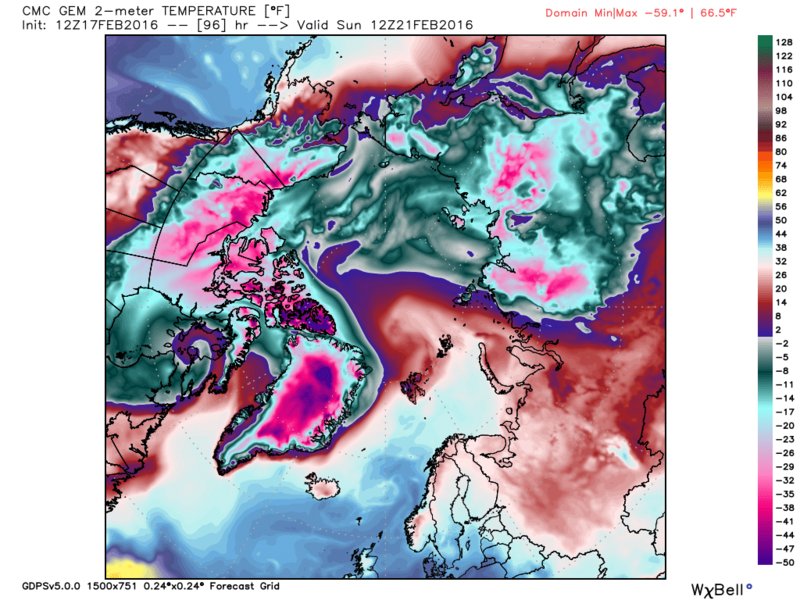 However there are a couple of areas outside the arctic that freeze over, which are interesting to watch. The first is the Sea of Okhotsk east of Russia and north of Japan. Extremely cold air has been pouring into the Pacific off Asia, and these waters are starting to freeze over swiftly. (Their refreeze were below-normal, earlier.) I have a hunch the variations in how these waters cool may have something to do with the end of the “warm” spike in the PDO. The second is the northern reaches of the Baltic Sea, especially the Gulf of Bothnia between Sweden and Finland. Those waters are just plain fascinating to me, because so many fresh water rivers pour into the Baltic Sea that the further north you go the fresher the water becomes, until in the very north of the Gulf of Bothnia fresh water fish can swim in the Sea. Because the water is so much fresher it freezes more easily, and the northern Baltic becomes a hypersensitive measure of Scandinavian cold. 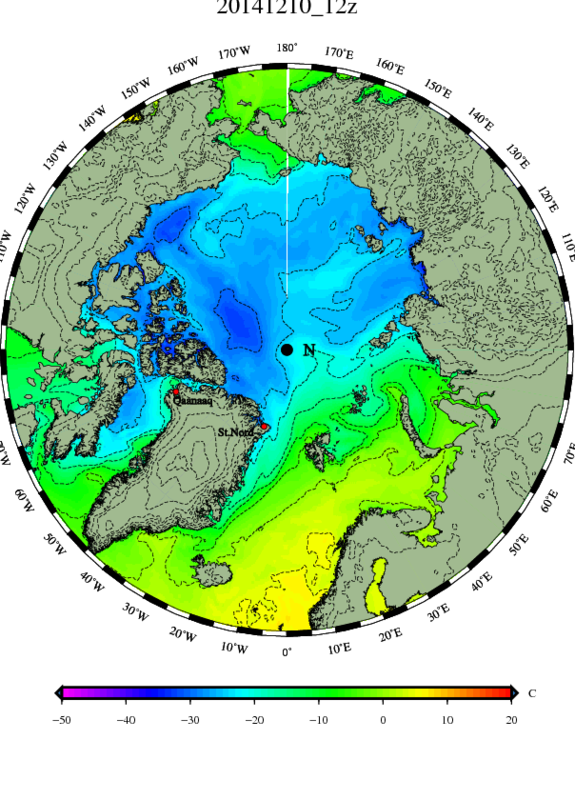 When southwest winds and the Atlantic rules, there is little freezing, but when winds shift to the brutal east, the entire Baltic can freeze. Having discussed the extent maps, I’ll swiftly go over the daily maps. I apologize for not being able to name the individual storms like I did last year. Other areas of my life got too bossy. One obvious difference from last year has been that storms don’t ride along the arctic coast of Eurasia from Barents Sea, through the Kara and Laptev Seas, all the way to the East Siberian Seas, and meet up with Pacific storms in the Chukchi Sea. Instead they run into a wall, and are bent north to the Pole and even Canada, or south into Russia. 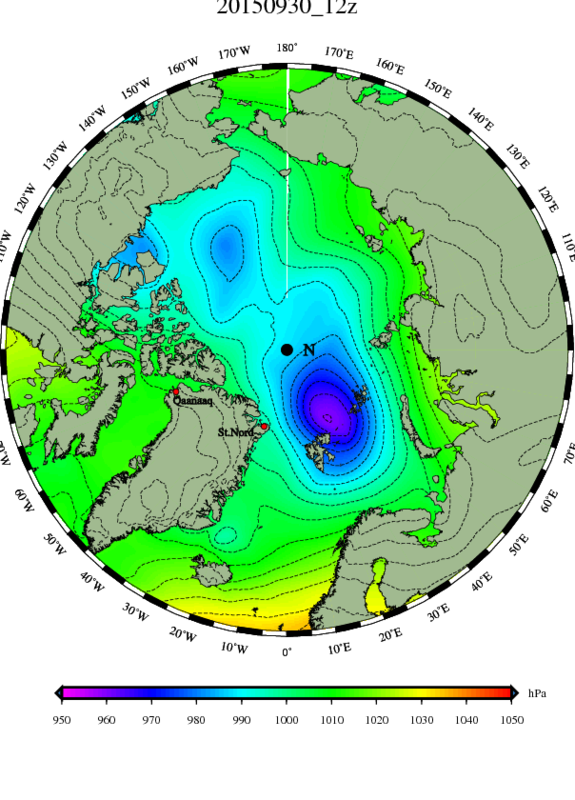 Back on November 29 an Atlantic storm had crashed into the wall and devided, with half heading towards Canada and half down into Russia. In the process it brought a huge surge of Atlantic air north over the Pole. Last year this Atlantic air surged over Europe and kept them relatively warm all winter, but this time that mildness was wasted on sea ice. At this point something ominous happened, if you live in Scandinavia. My ears perked forward in interest, for it may be a forerunner of what could become a pattern, later in the winter. This time it was quickly rebuffed, but later in the winter ic could “lock in”. What happened is that as the low pressure was defected south into Russia high pressure extended west to its north, creating a flow of east winds along the arctic coast. 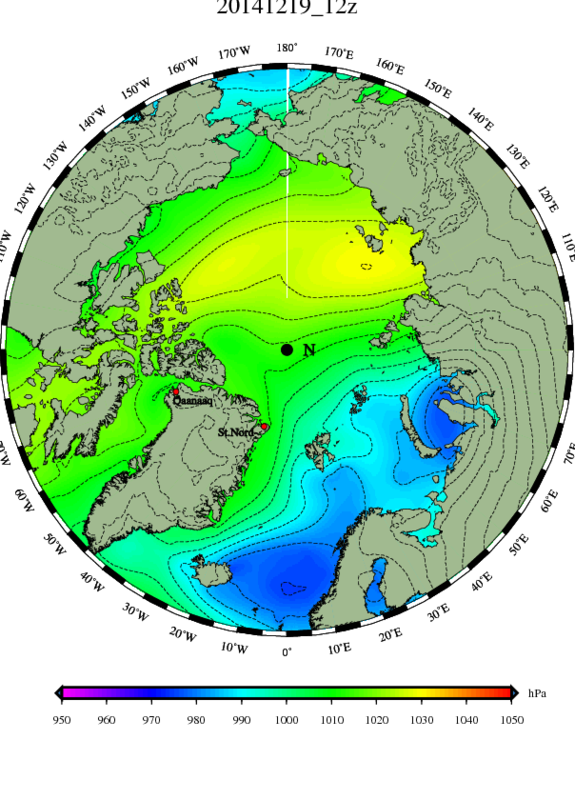 Brutally cold Siberian air rolled west (last winter I called it “the snout of Igor”), and Europe chilled, though not to the degree it could have chilled if the east winds had continued. On December 1 there is a cross-polar-flow from the Atlantic to the Pacific, drawing mild Atlantic air right across the Pole. The flow is about as non-zonal as it can be. If you are into looking for proof of Global Warming, now is the time you point out a spike in temperatures at the Pole, but the exact same spoke can be used as a disproof. What you need to do is think of how a summer thunderstorm uplifts hot and muggy air and breeds a cooling shower, and use that as an analogy for what is occurring on a far grander scale up at the cap of the planet. Warm air is uplifted, heat is lost, and the air comes down cooler. 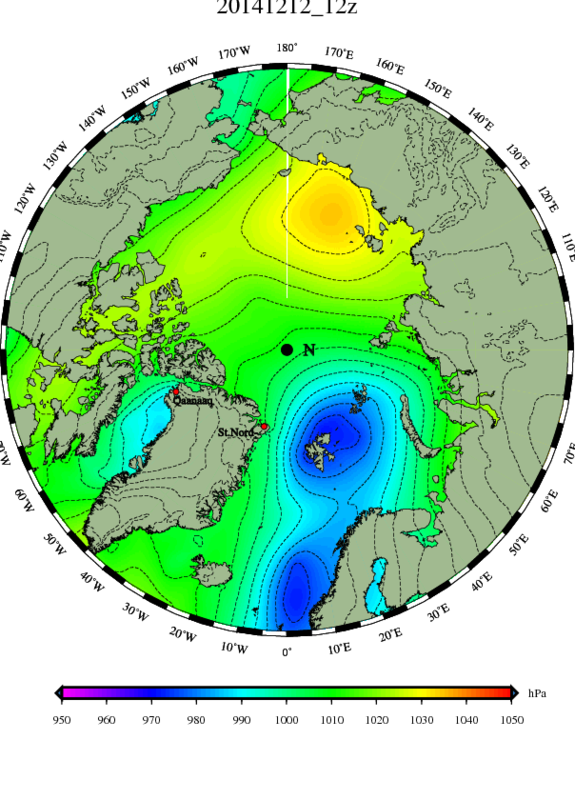 Europe was spared the icebox of an arctic outbreak from the east by a series of lows that pushed the high pressure (and its east winds,) north to the Pole. However rather than this low pressure bumping the high pressure over to Canada and continuing on to the east, the low itself got deflected north as high pressure again built ahead of it. 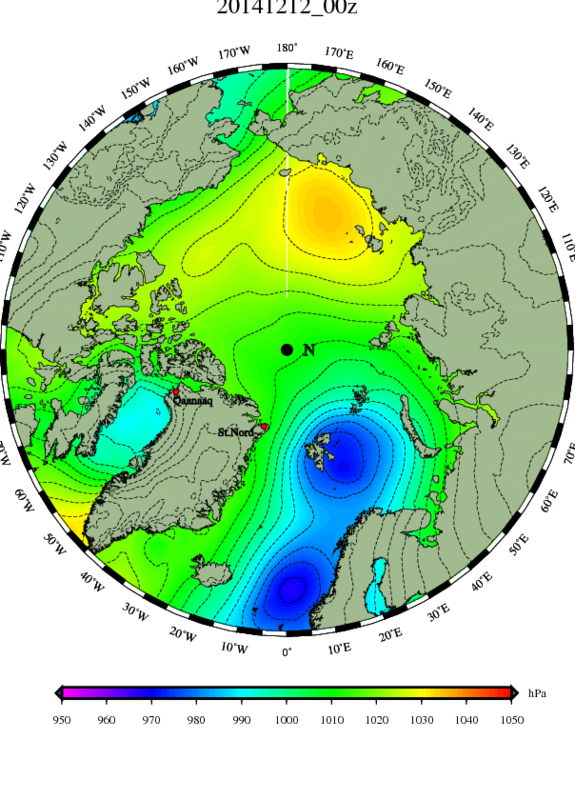 A new cross-polar-flow, this time from Asia to Canada, began to appear, and temperatures at the Pole crashed. 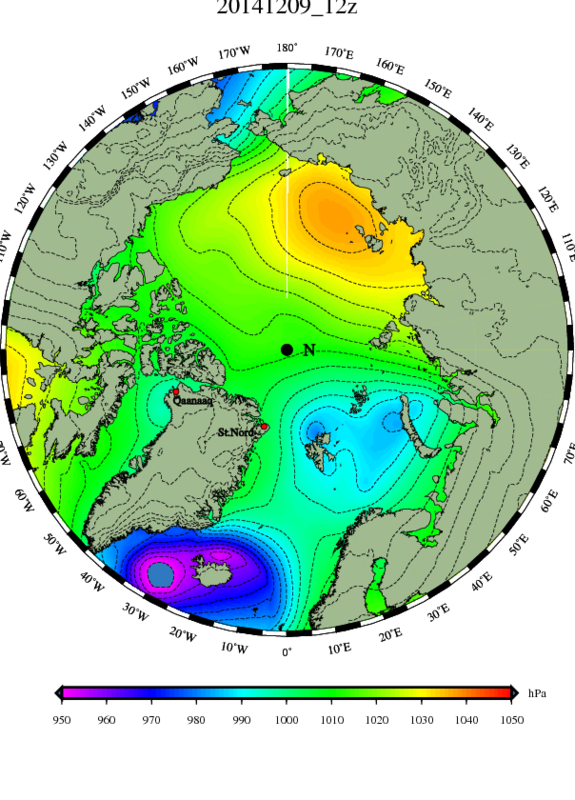 By December 6 the most recent pattern began to manifest, and the final seven maps showing storm after storm failing to get across the Atlantic, and instead curling around north of Norway back towards Greenland. This has created a second invasion of milder Atlantic air to pour north through Scandinavia, on the east side of storms, as frigid winds howl down the east coast of Greenland and make Iceland cold on the west side of storms. This pattern is (I assume) self-destructive, as eventually the North Atlantic (seemingly) will get too mild to its northeast and too cold to its southwest to perpetuate the pattern. Therefore I am watching in great interest to see signs of its demise, and to see what will set up next. 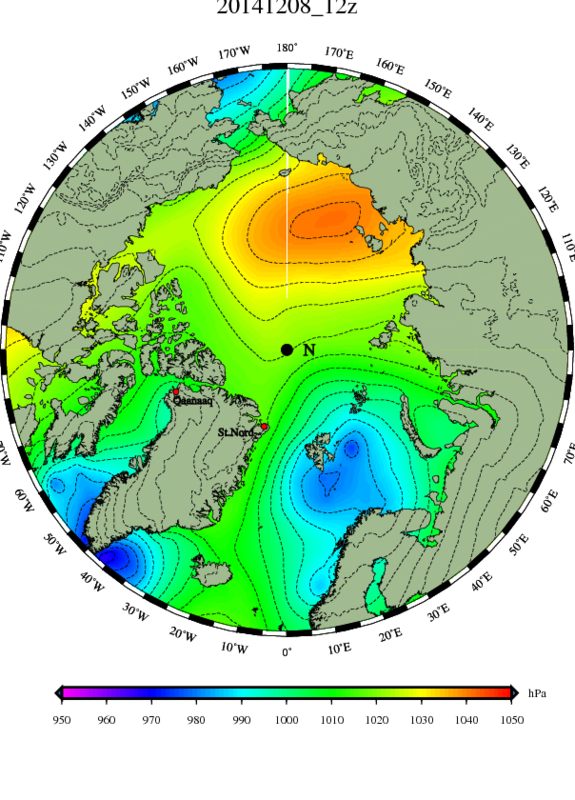 As a final interesting tidbit to this post I’ll add the graph of polar temperatures, which shows the big warming spike caused by the initial invasion of Atlantic air, the crash as the Siberian cross-polar-flow developed, and the start of a second spike as the second invasion of Atlantic air begins. 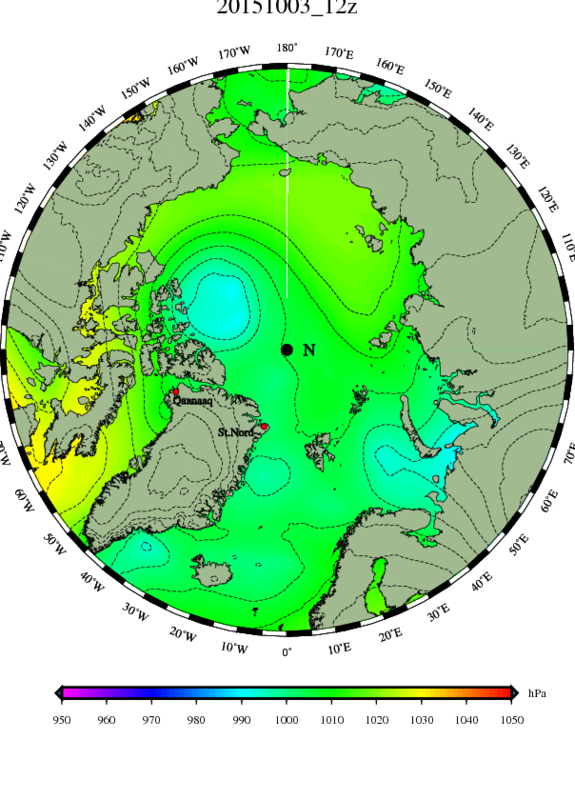 All in all I would say this winter is promising to be another winter when any semblance of a zonal flow is rare, and the sea-ice will be wracked and tortured by storms. It will be interesting to watch.